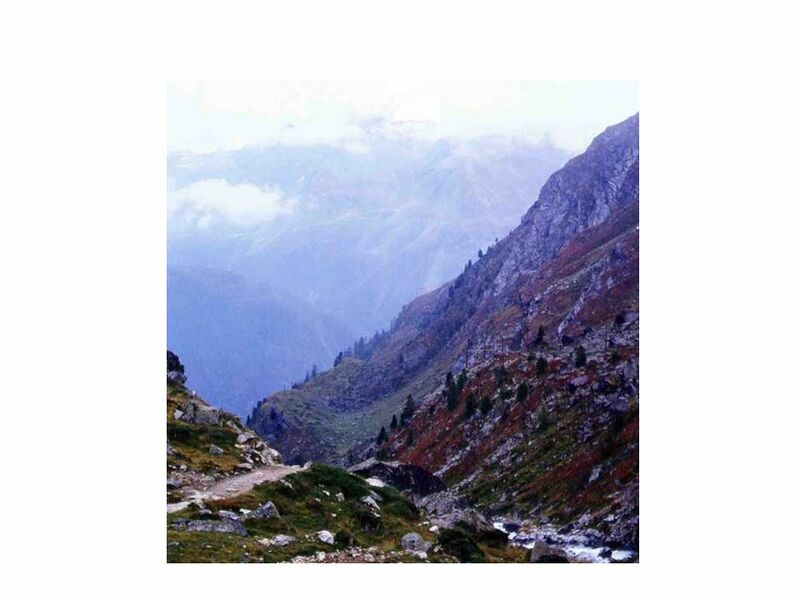 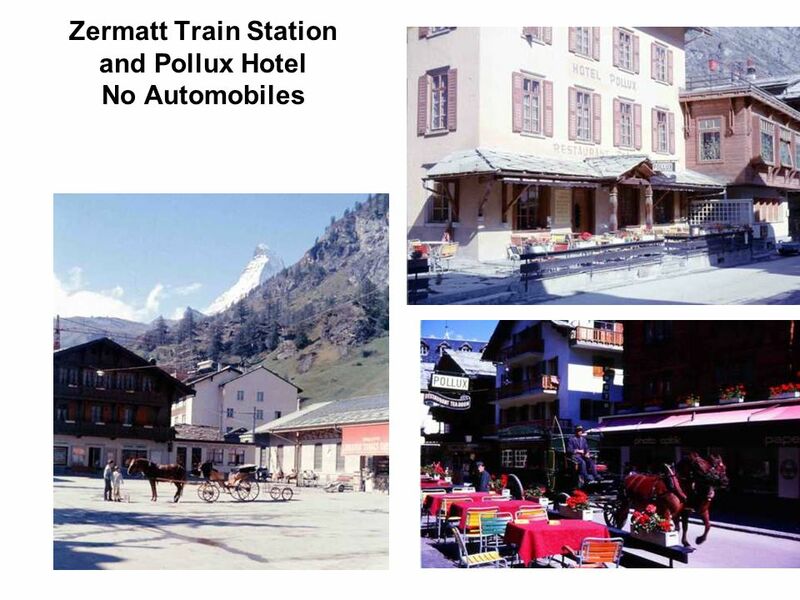 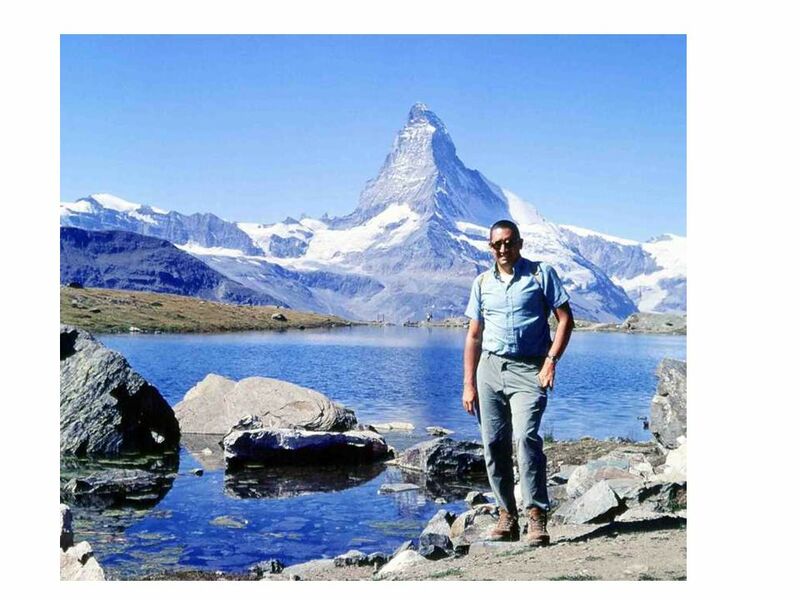 2 July-August 1958 During a driving tour of Europe with Dean Taylor taking train from Visp to Zermatt. 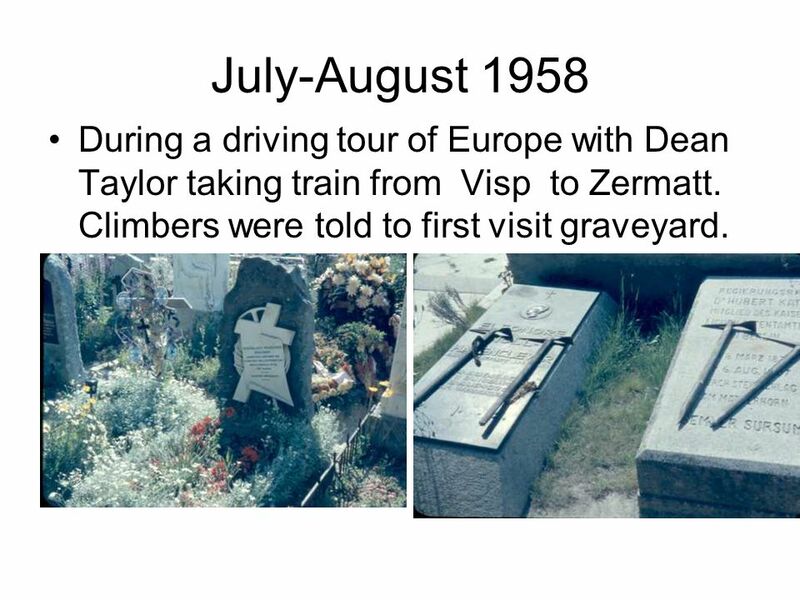 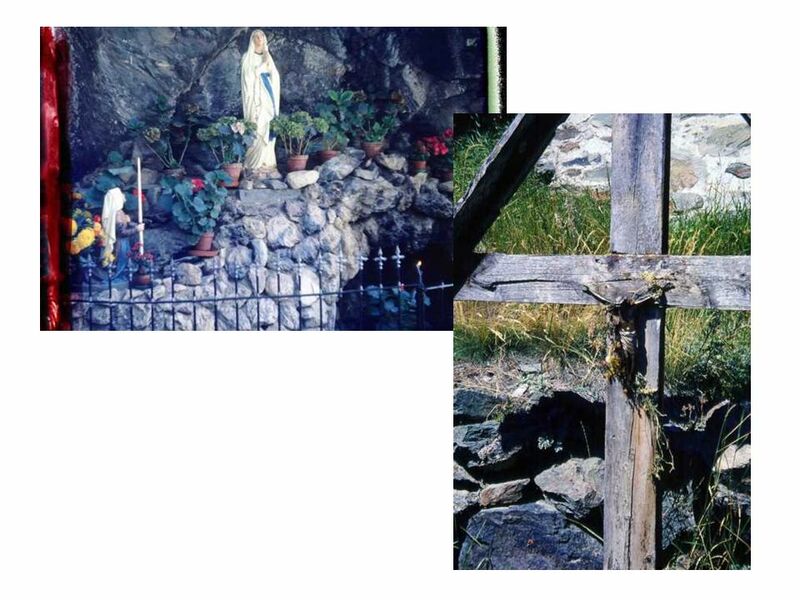 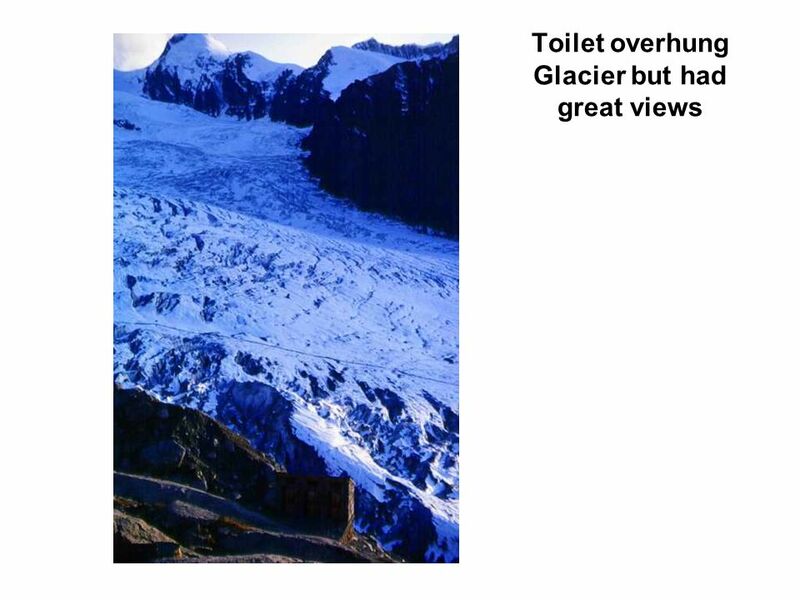 Climbers were told to first visit graveyard. 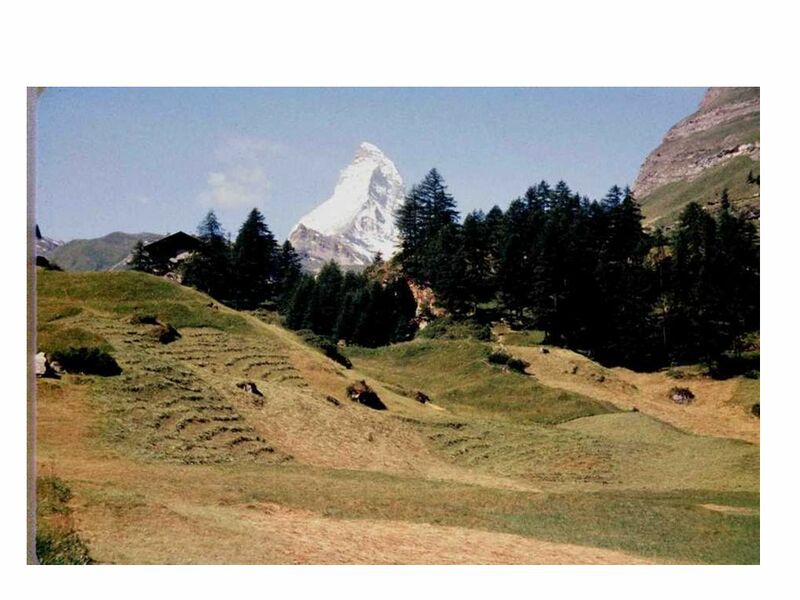 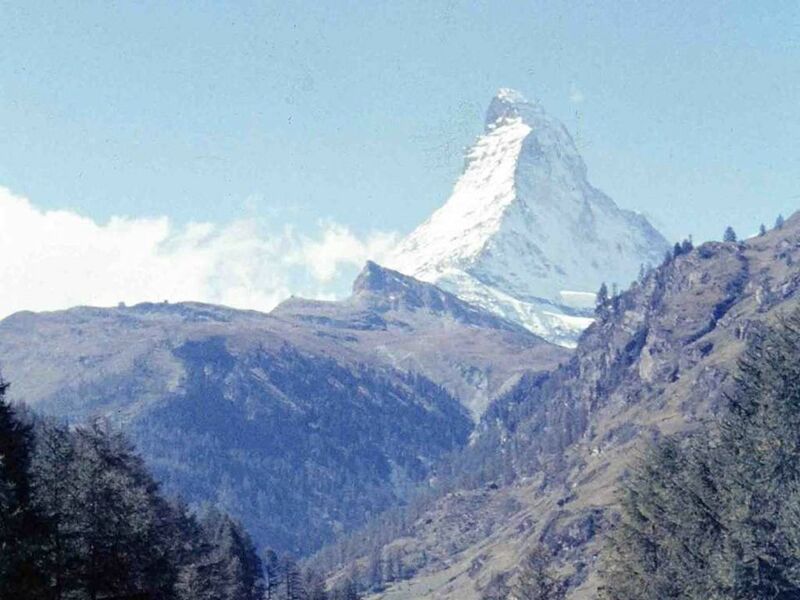 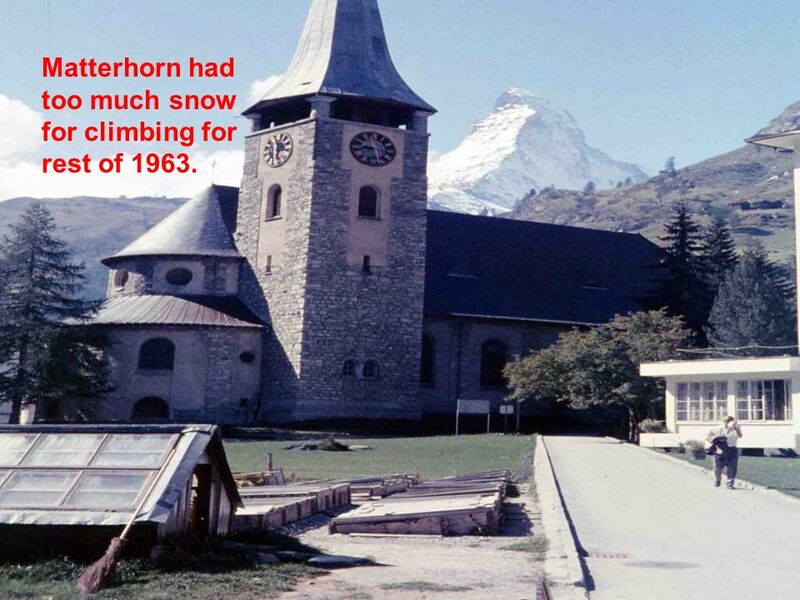 22 Matterhorn had too much snow for climbing for rest of 1963. 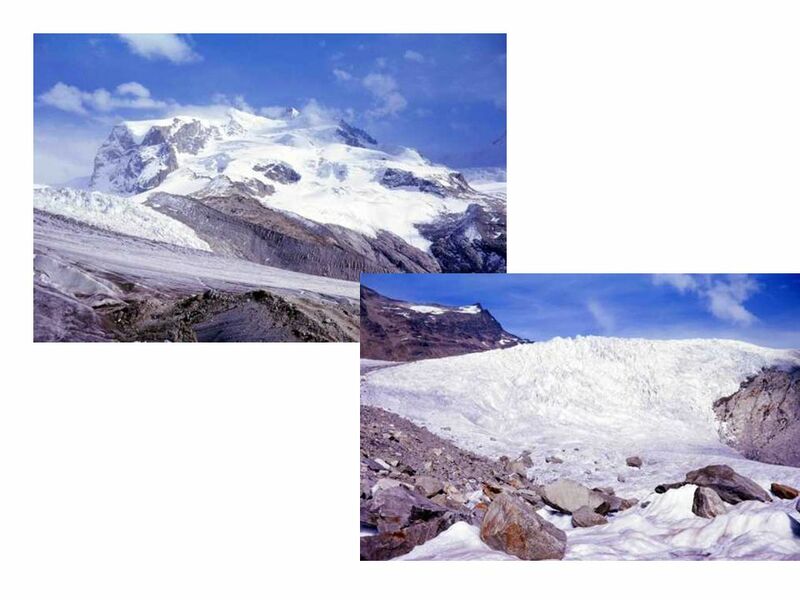 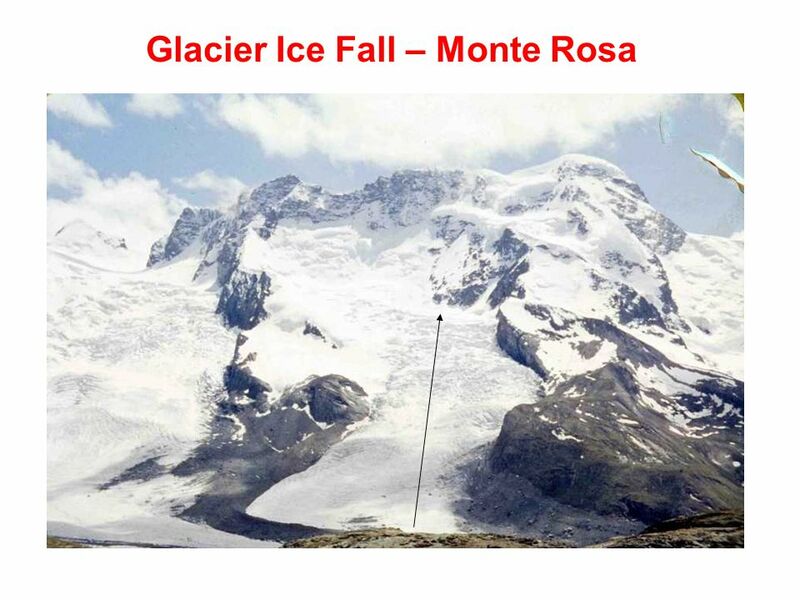 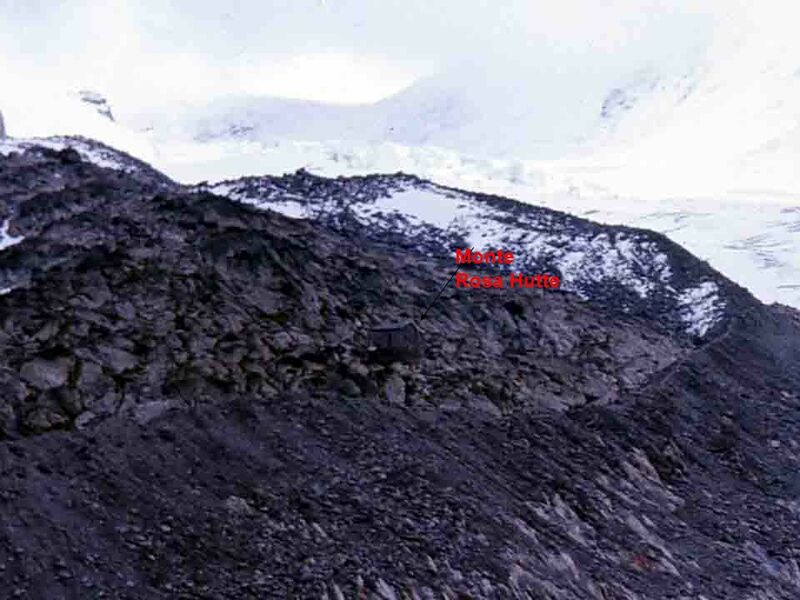 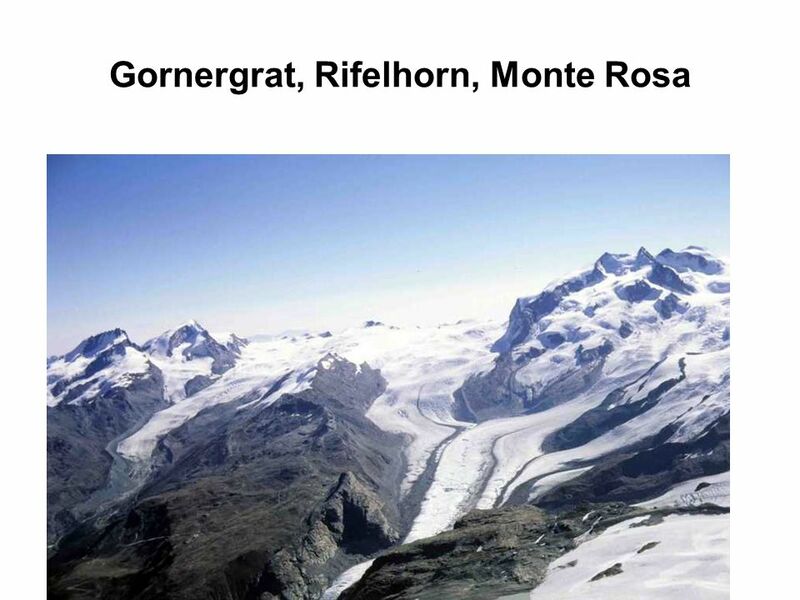 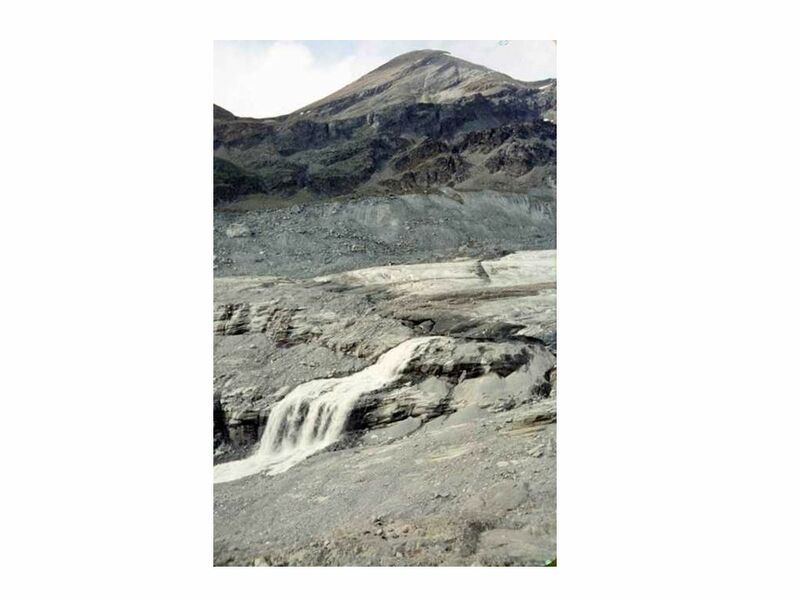 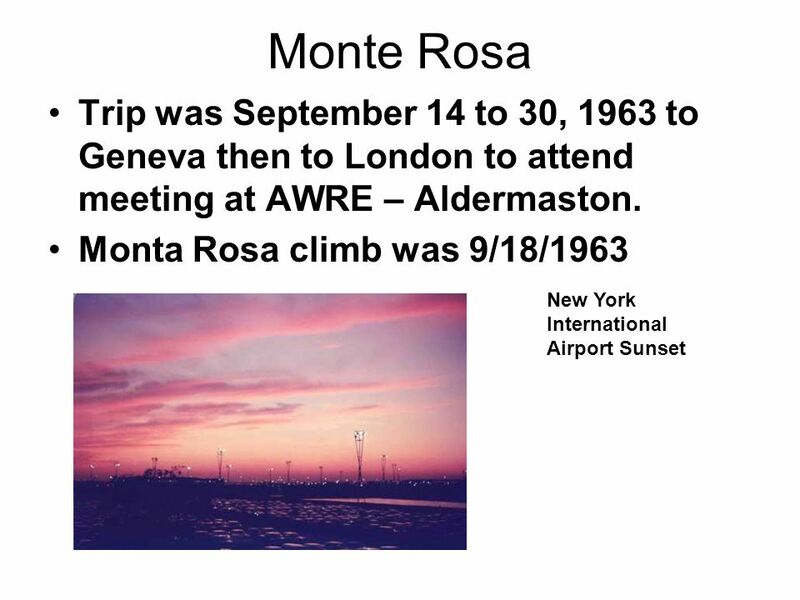 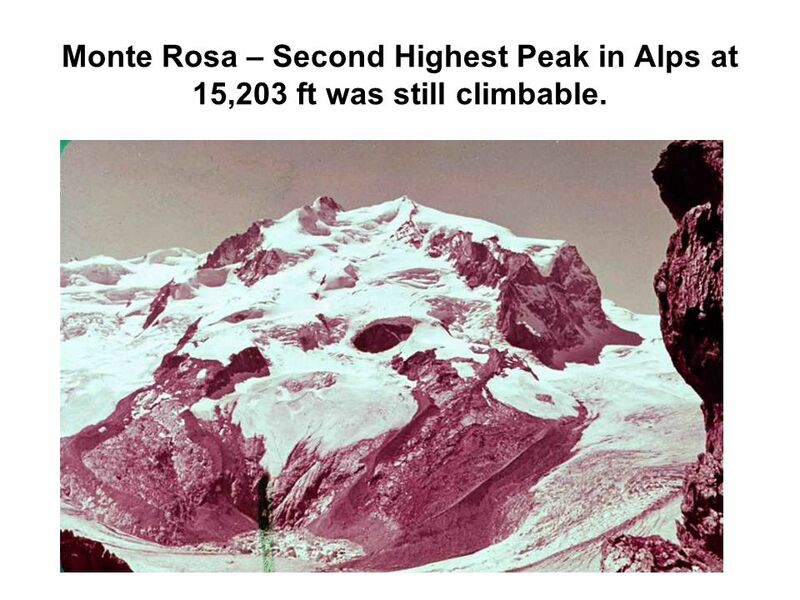 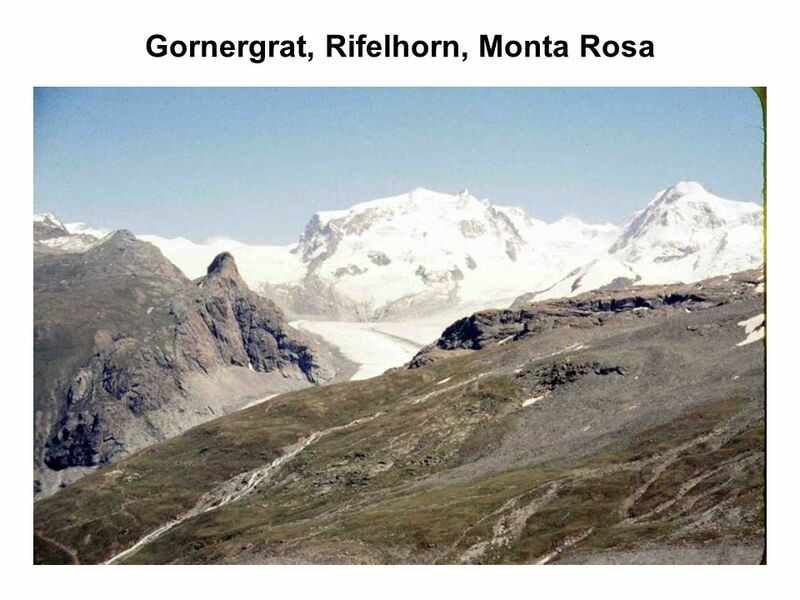 24 Monte Rosa – Second Highest Peak in Alps at 15,203 ft was still climbable. 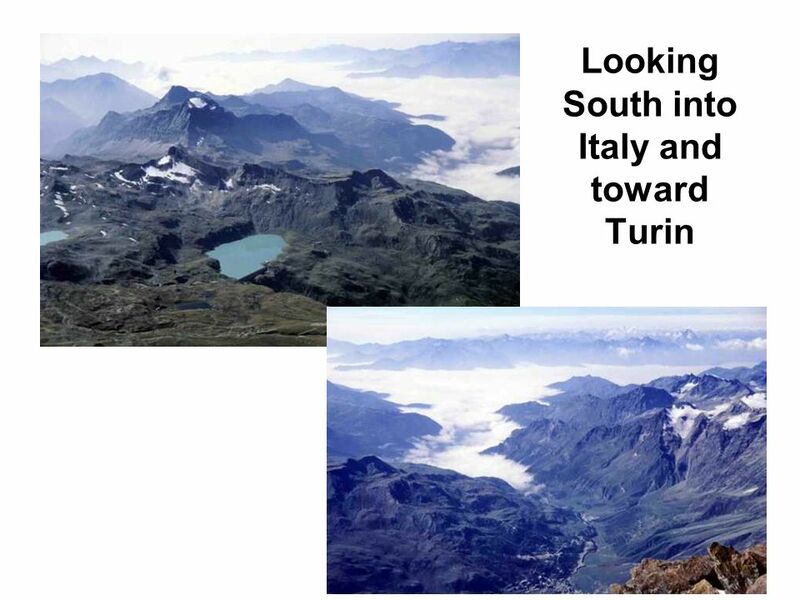 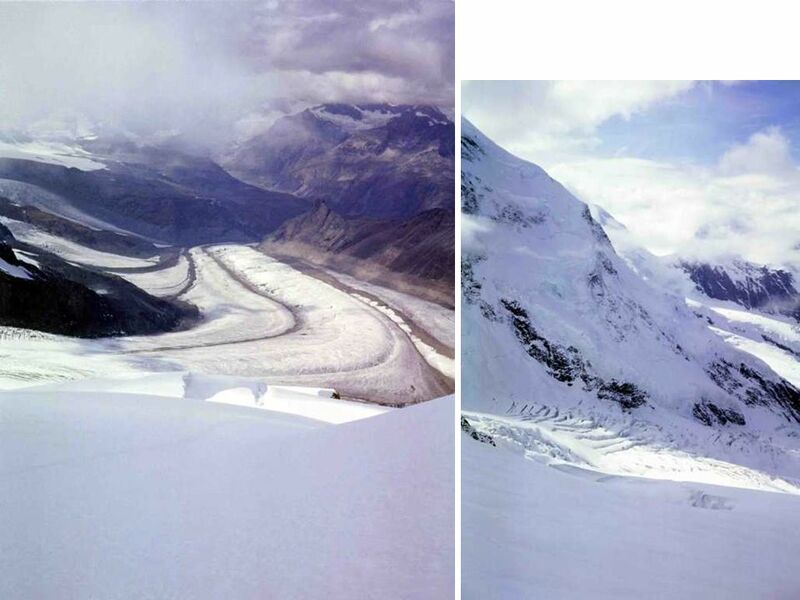 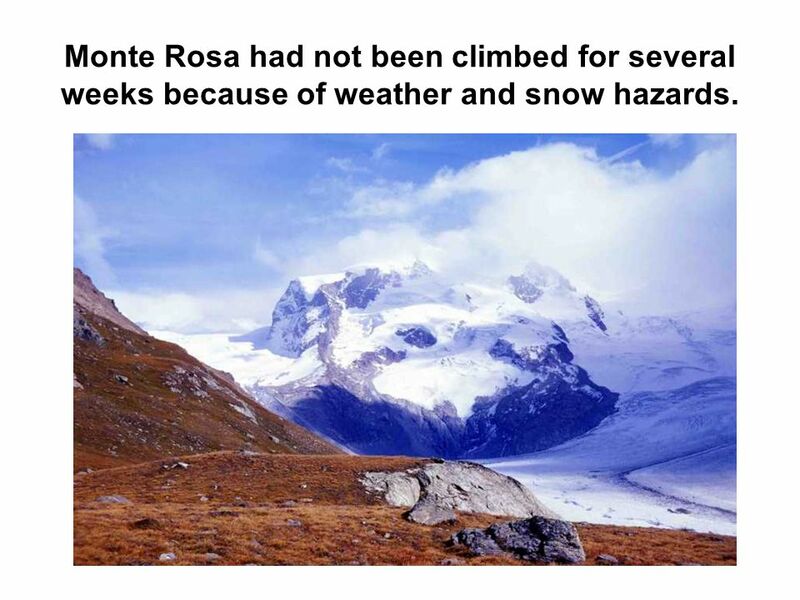 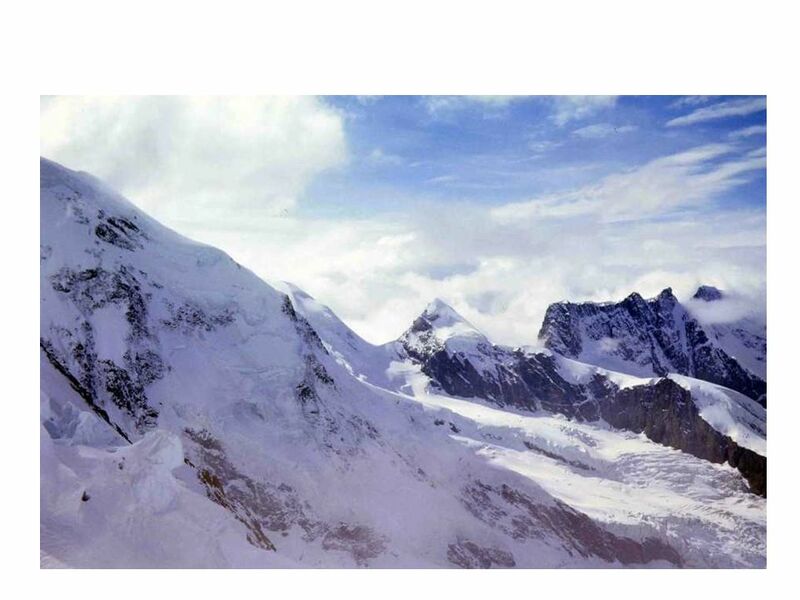 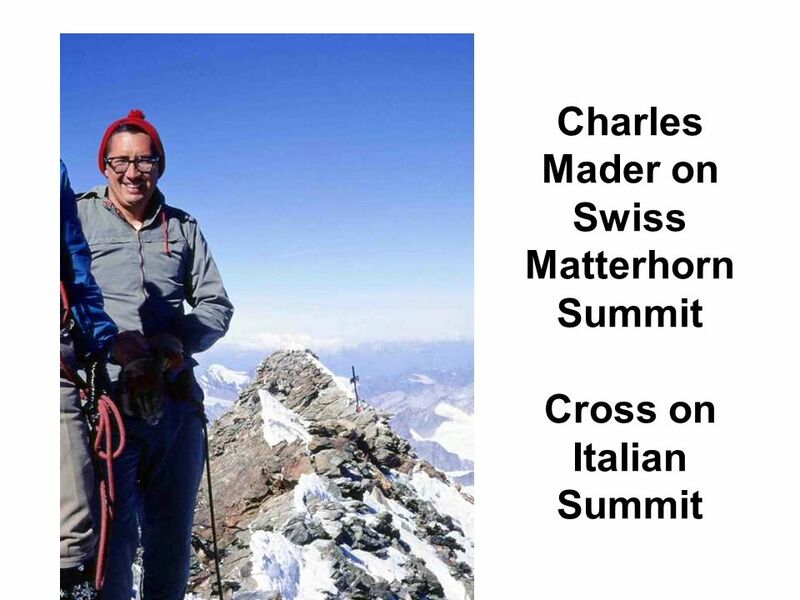 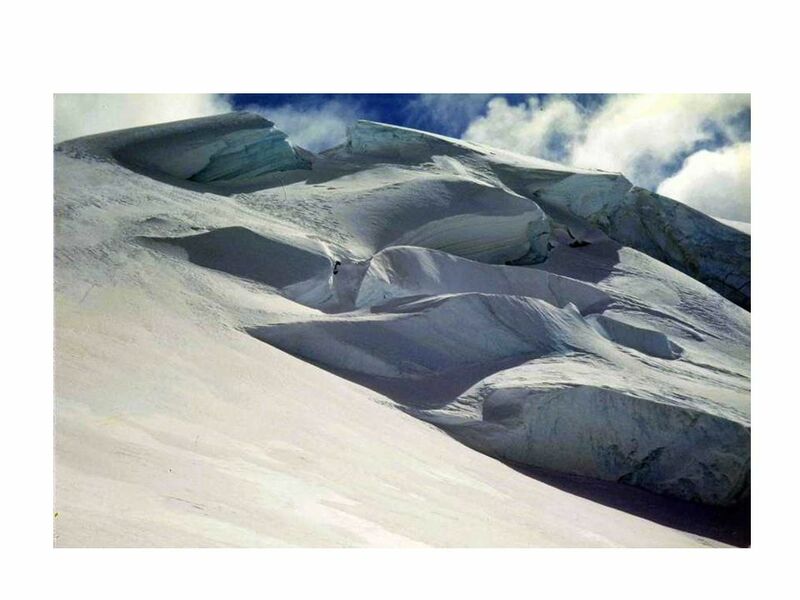 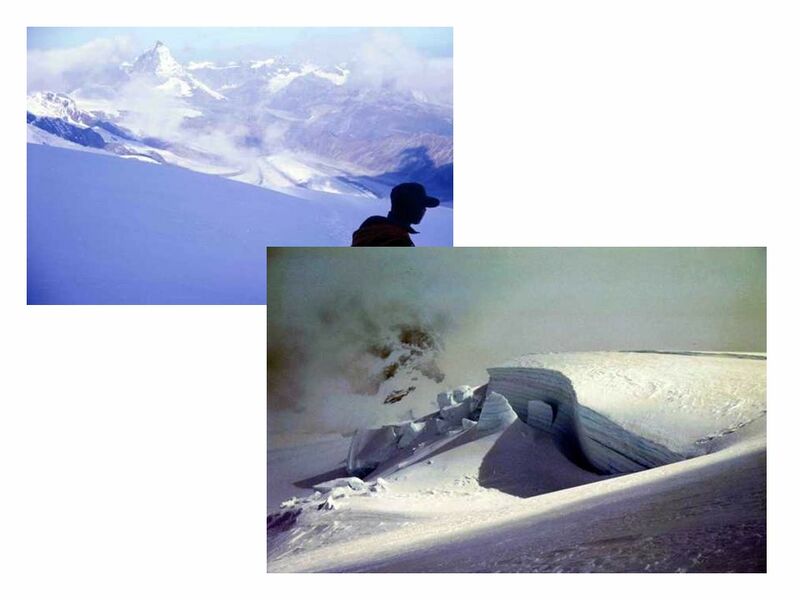 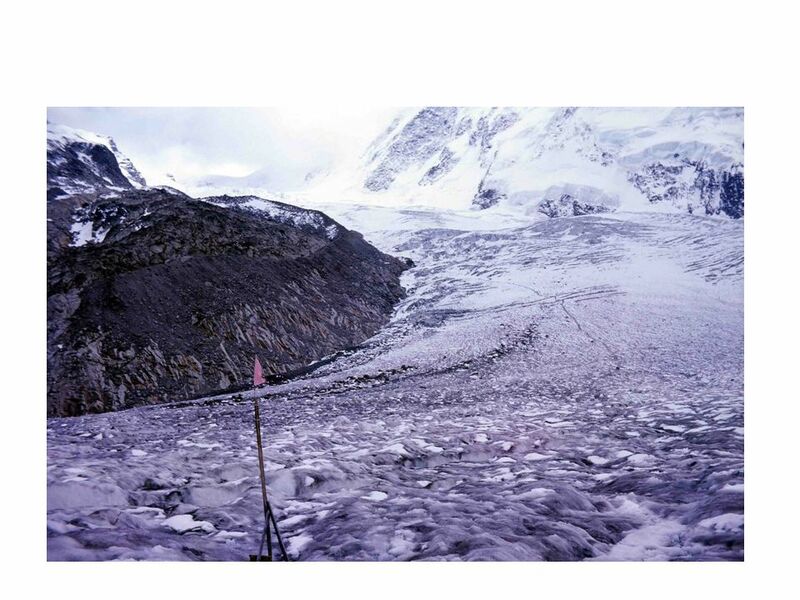 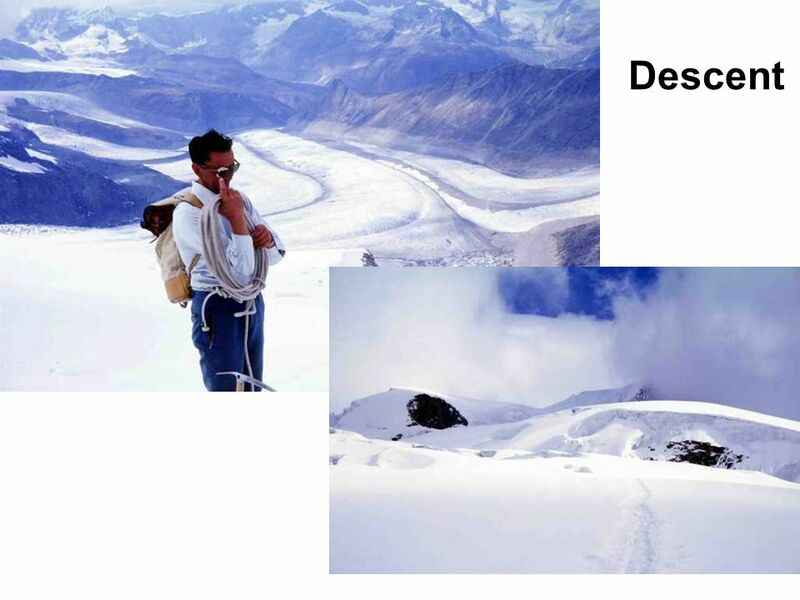 27 Monte Rosa had not been climbed for several weeks because of weather and snow hazards. 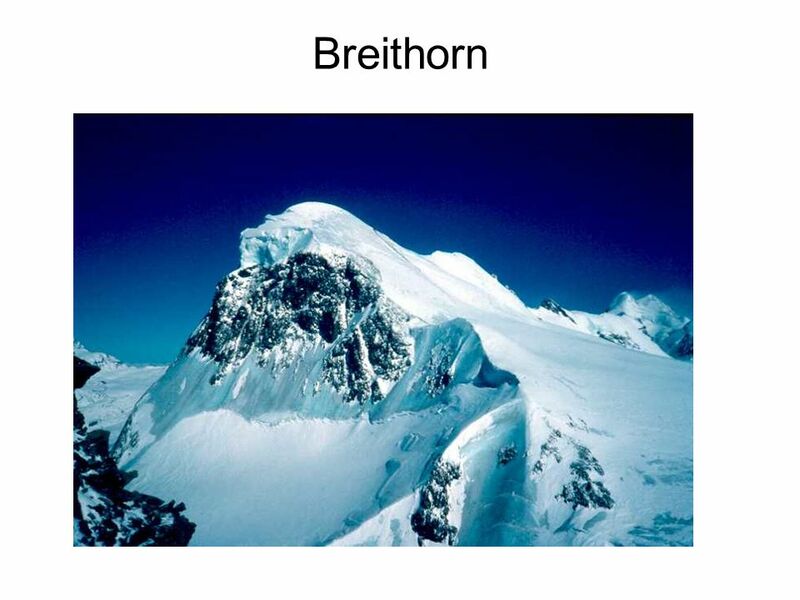 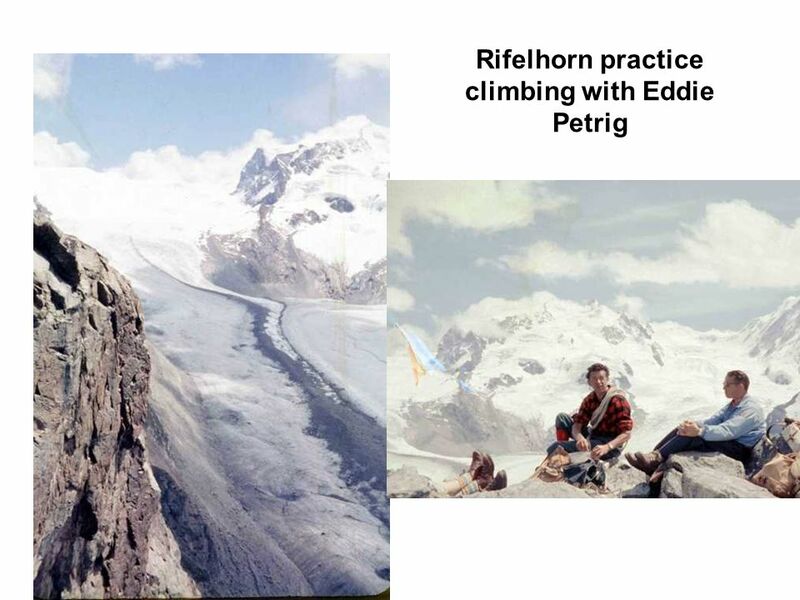 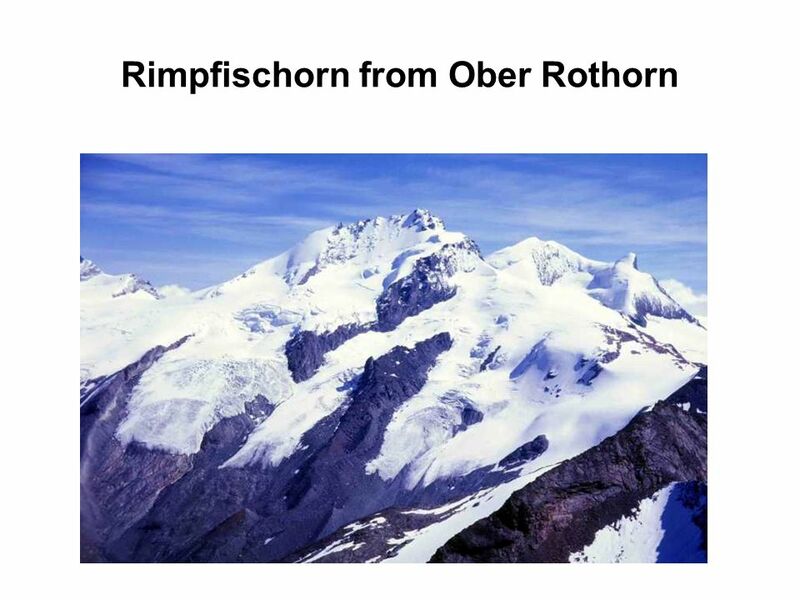 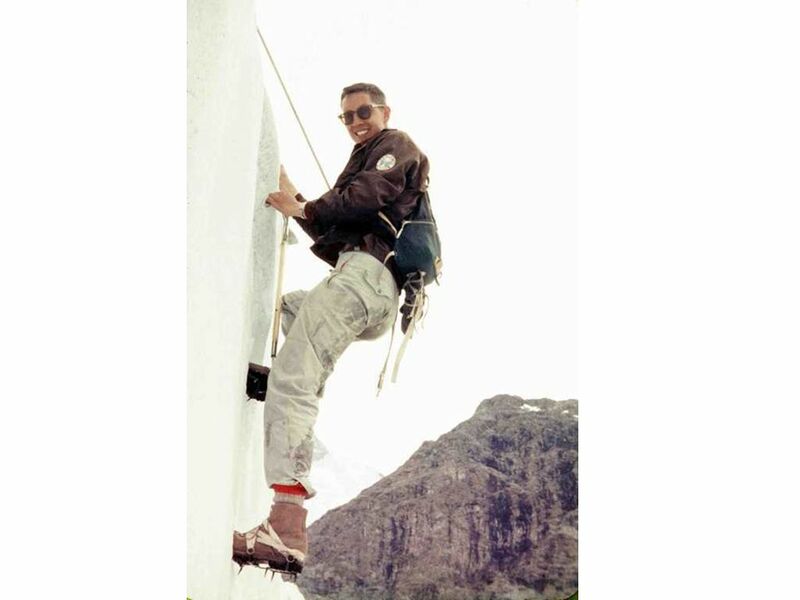 Bergfurher Eddie Petrig decides to climb. 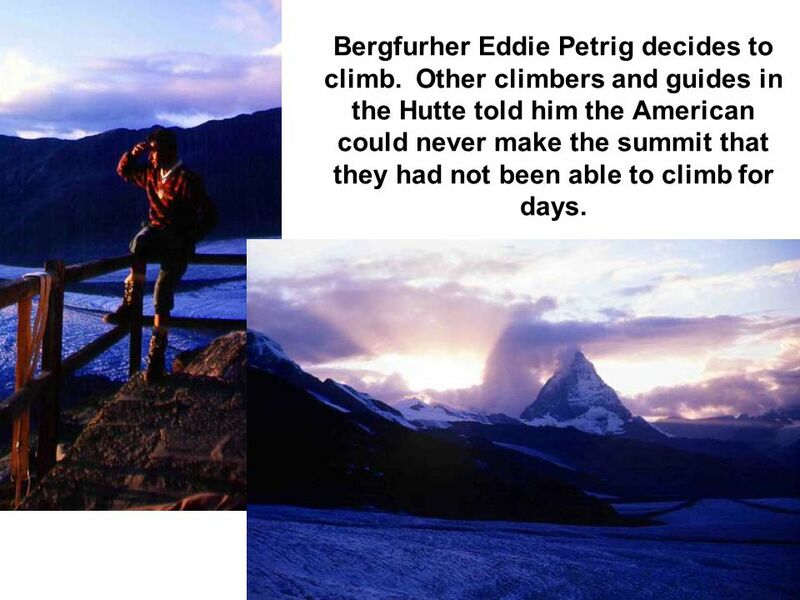 Other climbers and guides in the Hutte told him the American could never make the summit that they had not been able to climb for days. 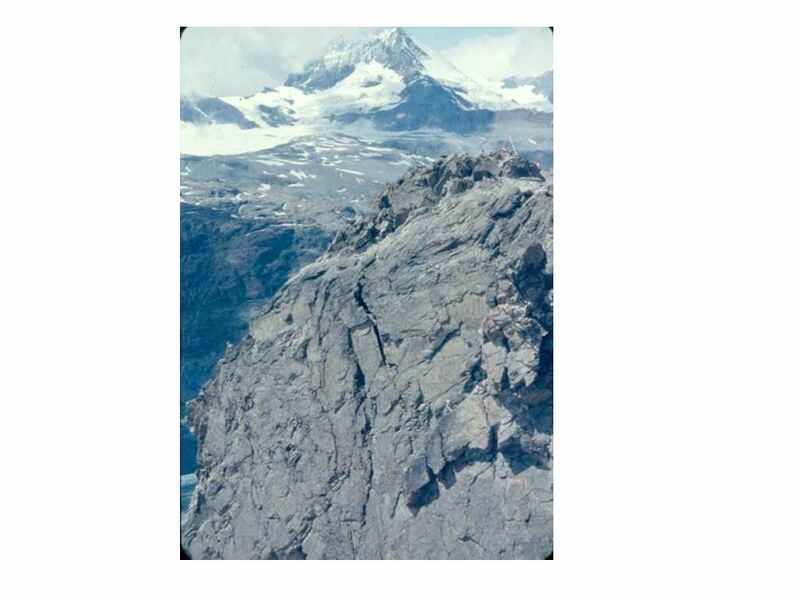 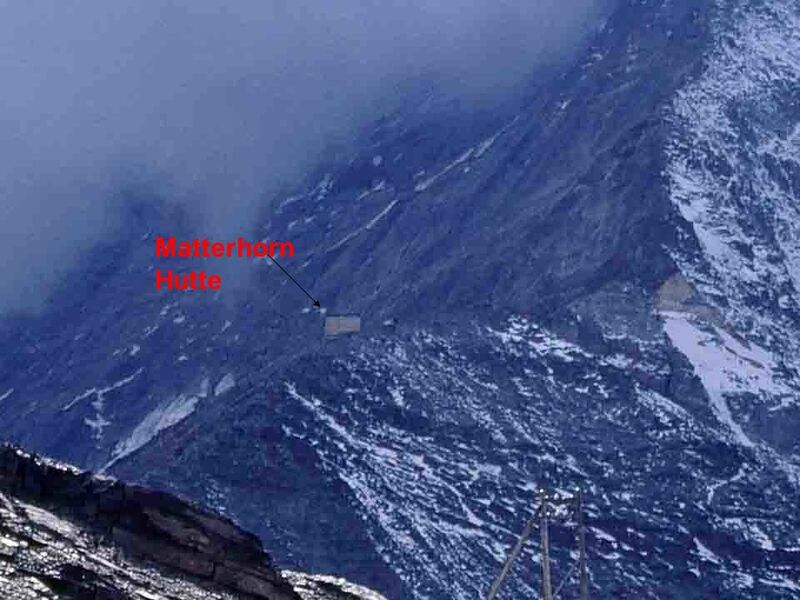 40 The climb to the summit of the Dufourspitze was in clouds on a snow covered ridge with plaques where climbers and guides had fallen. 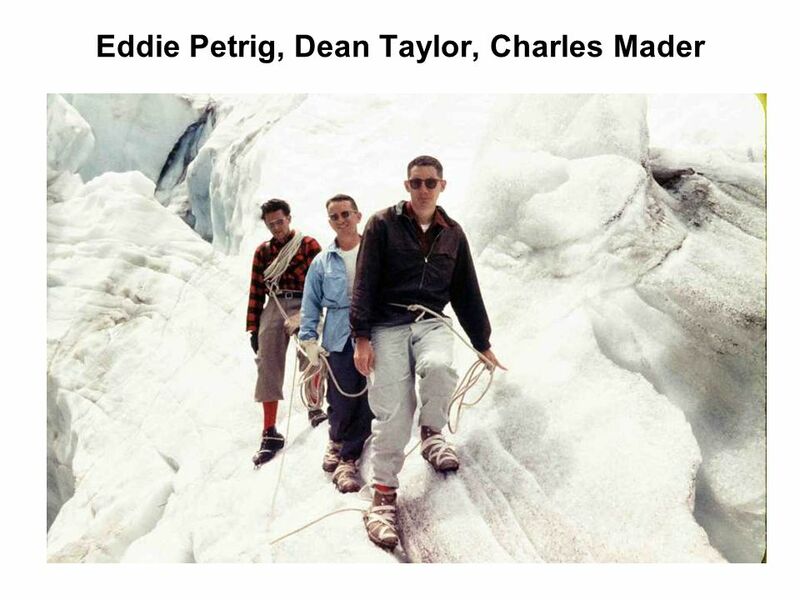 They made interesting reading while on belay. 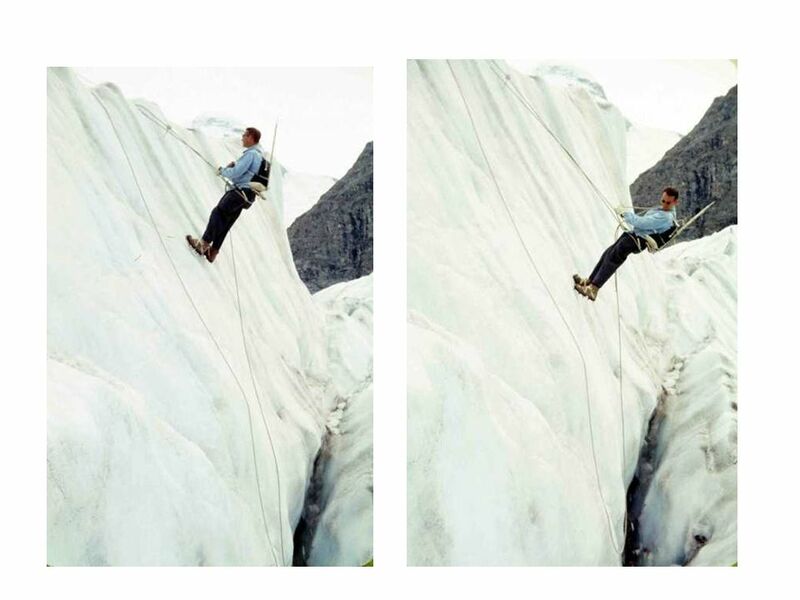 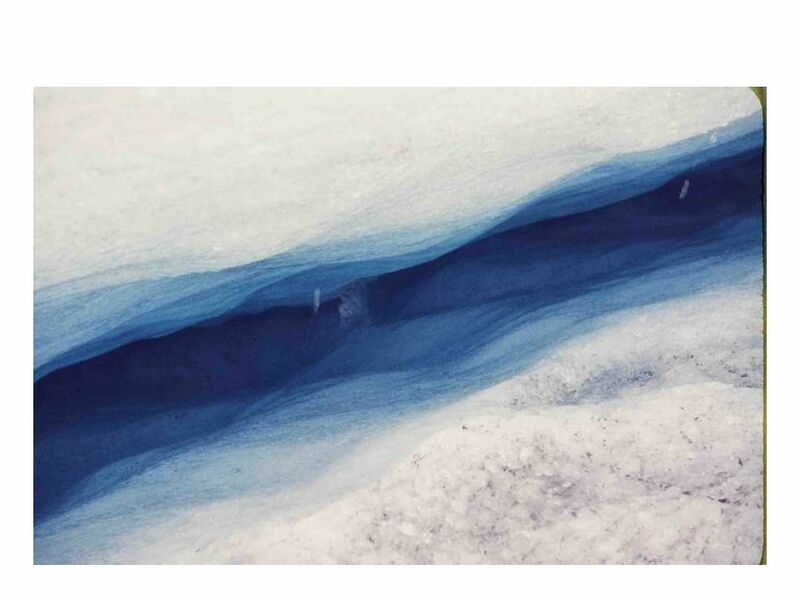 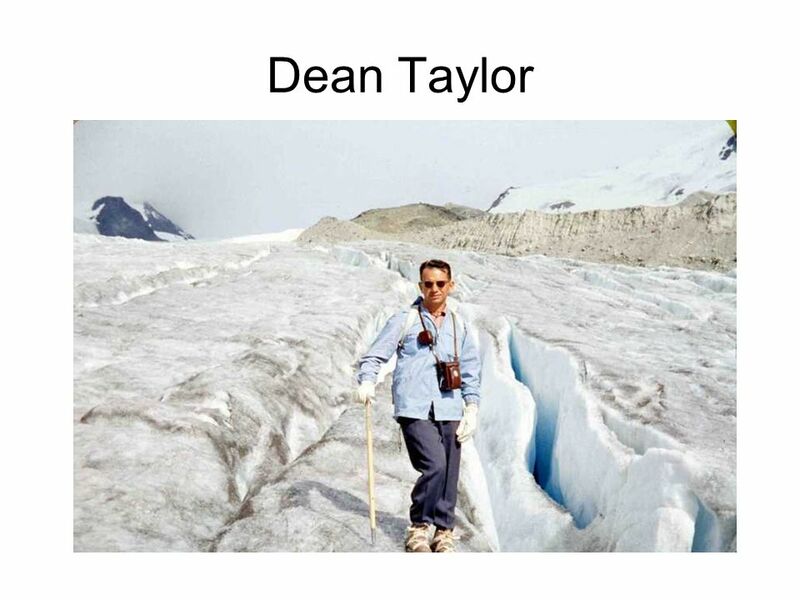 A snow gulley that Petrig was climbing came lose. 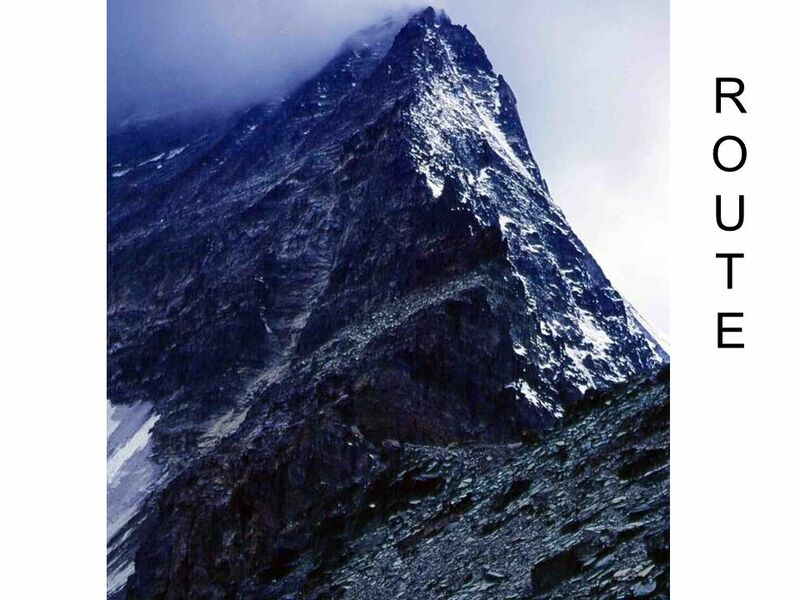 He called – “I hope you have it.” I called back “I am bombproof”. 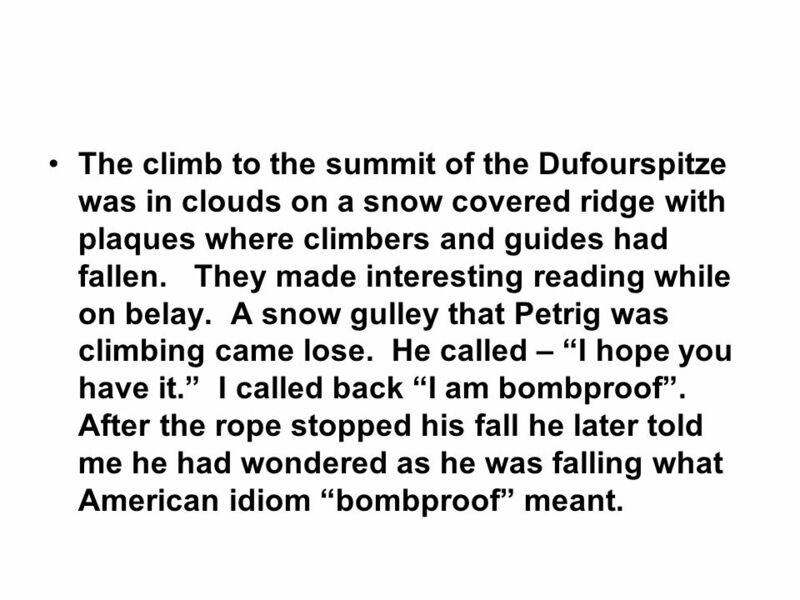 After the rope stopped his fall he later told me he had wondered as he was falling what American idiom “bombproof” meant. 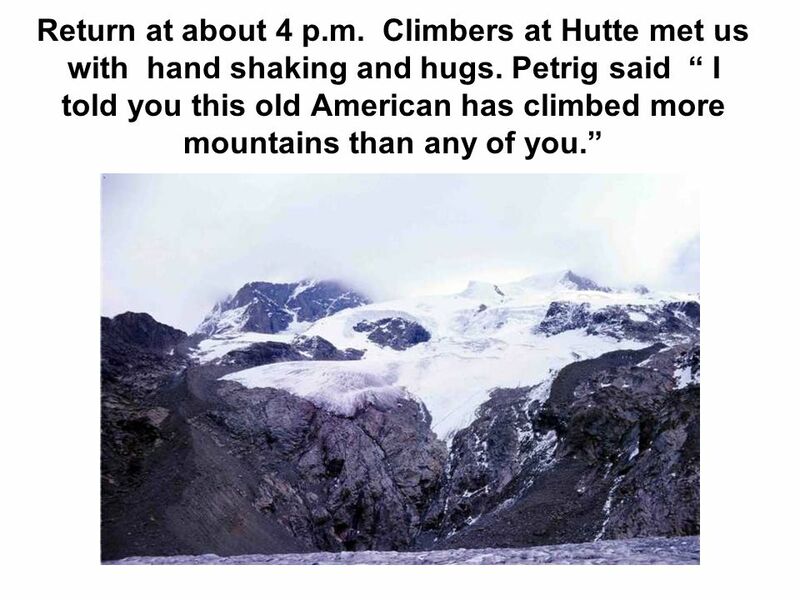 42 . 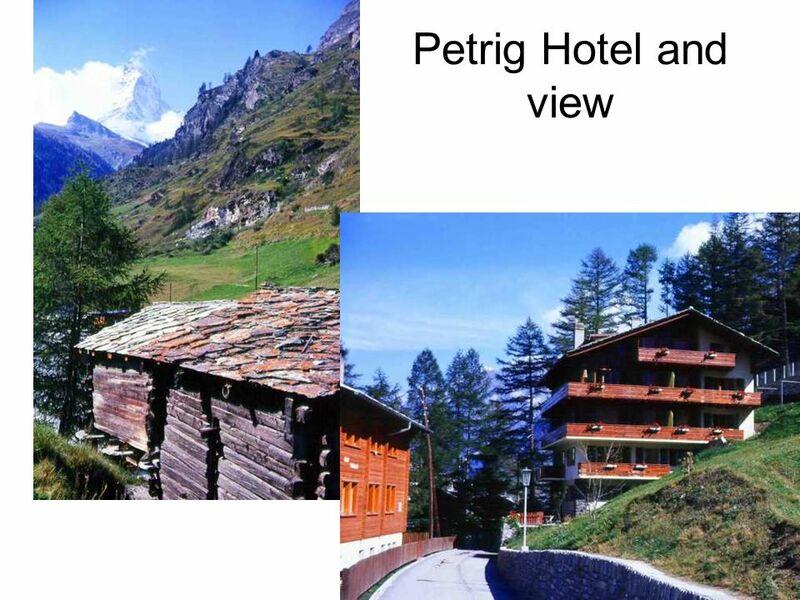 Petrig –Damn IT- Why did you stop? 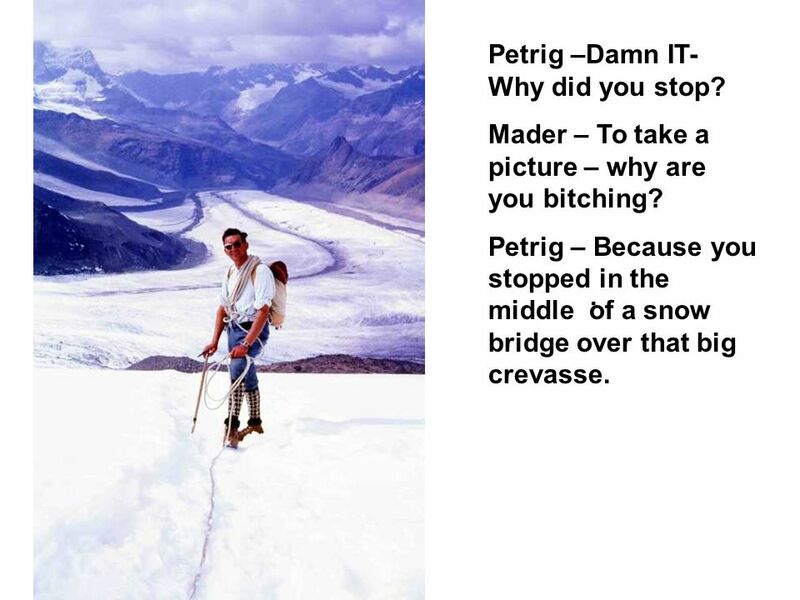 Mader – To take a picture – why are you bitching? 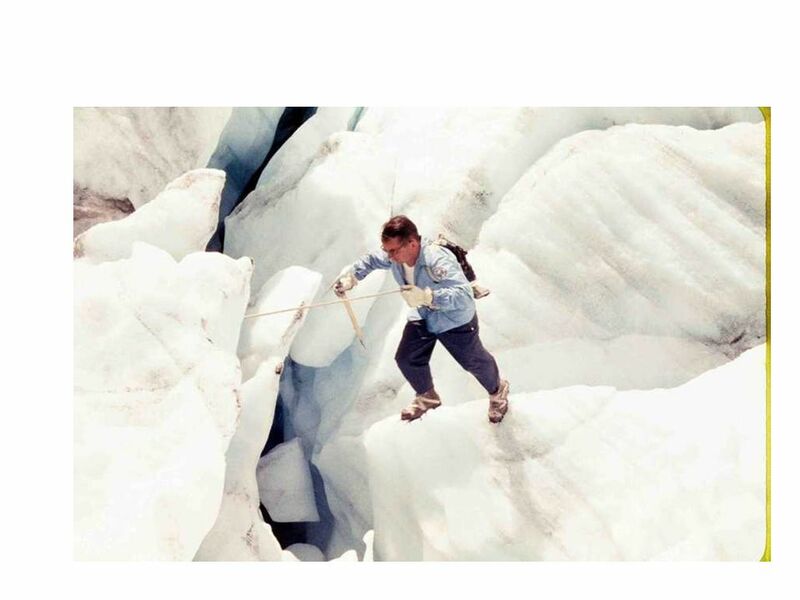 Petrig – Because you stopped in the middle of a snow bridge over that big crevasse. 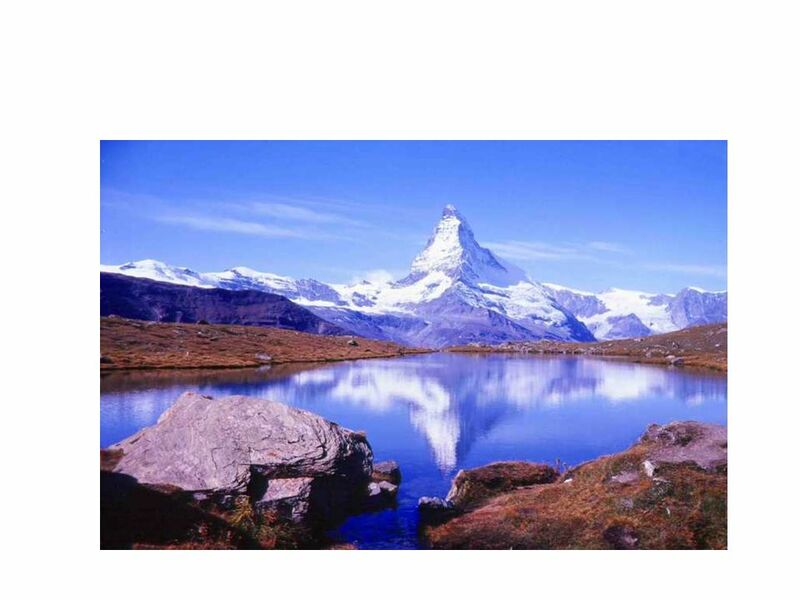 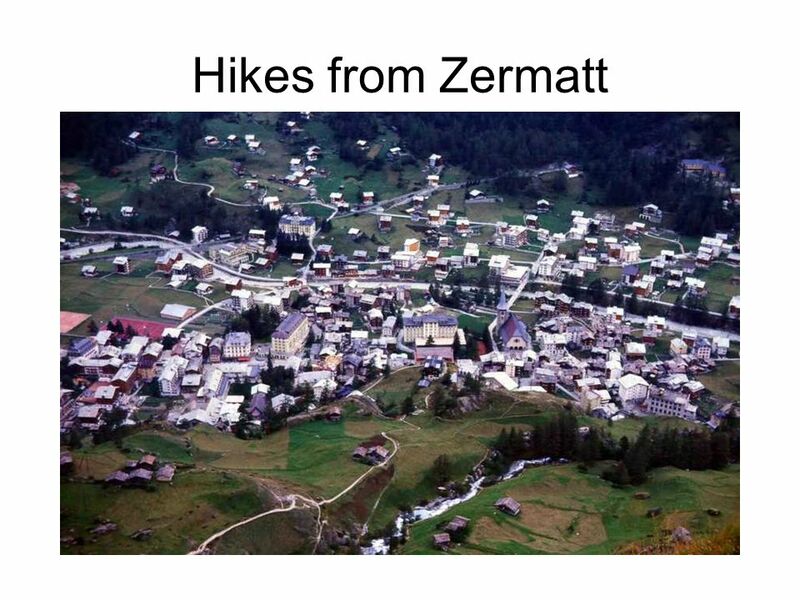 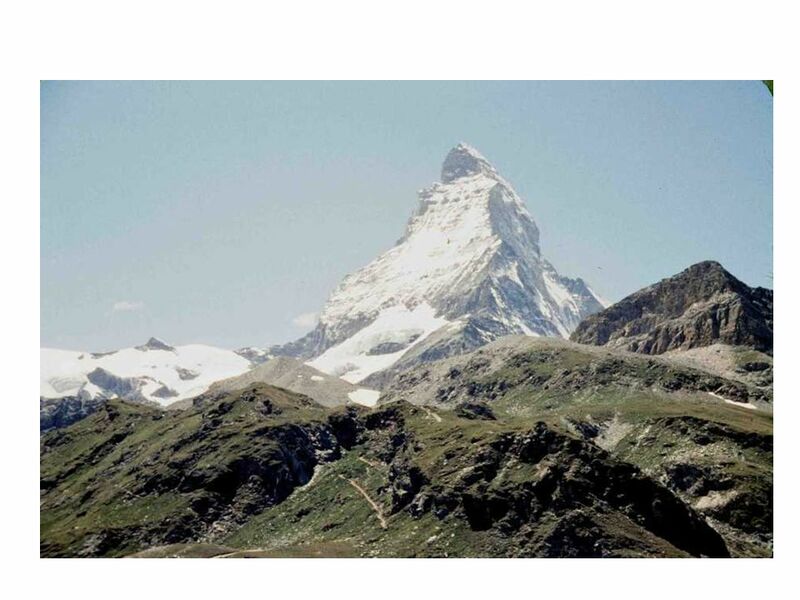 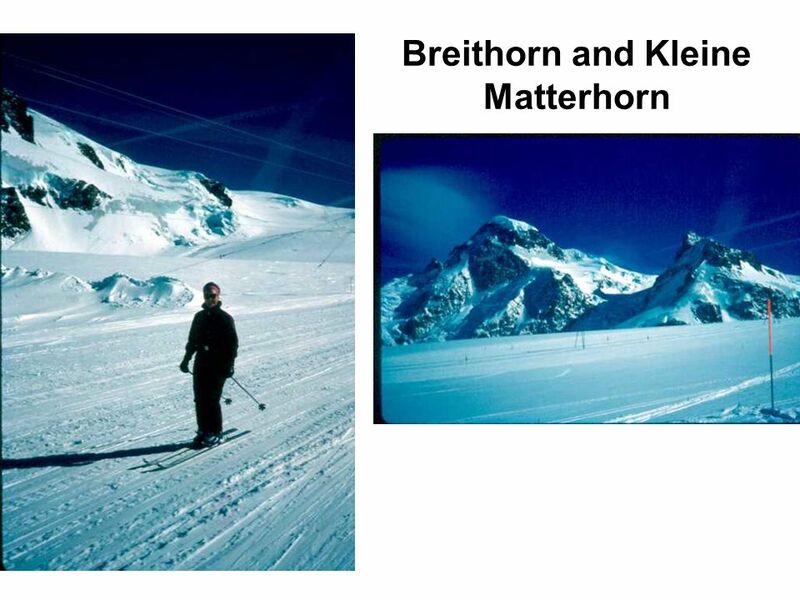 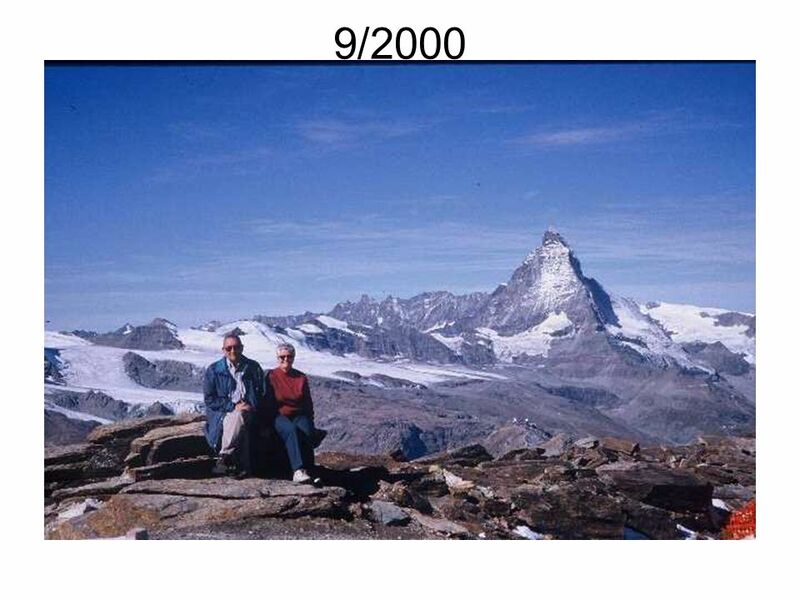 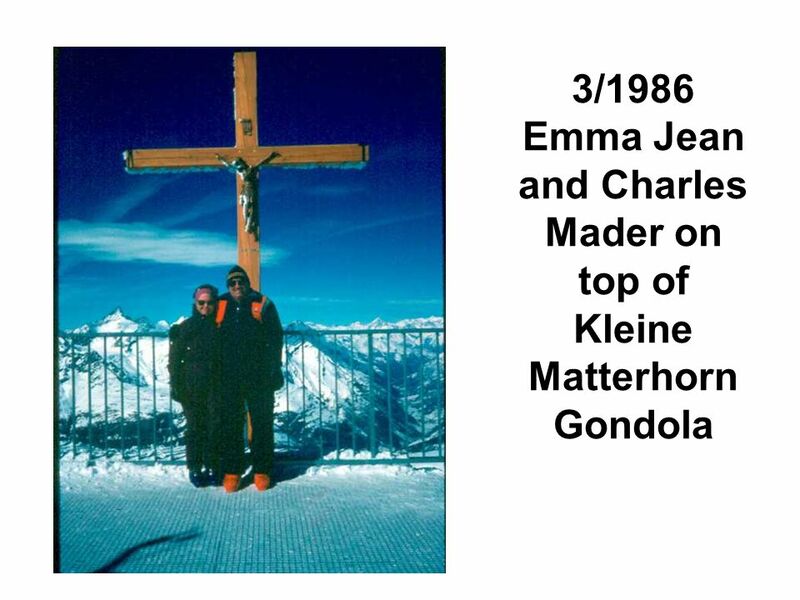 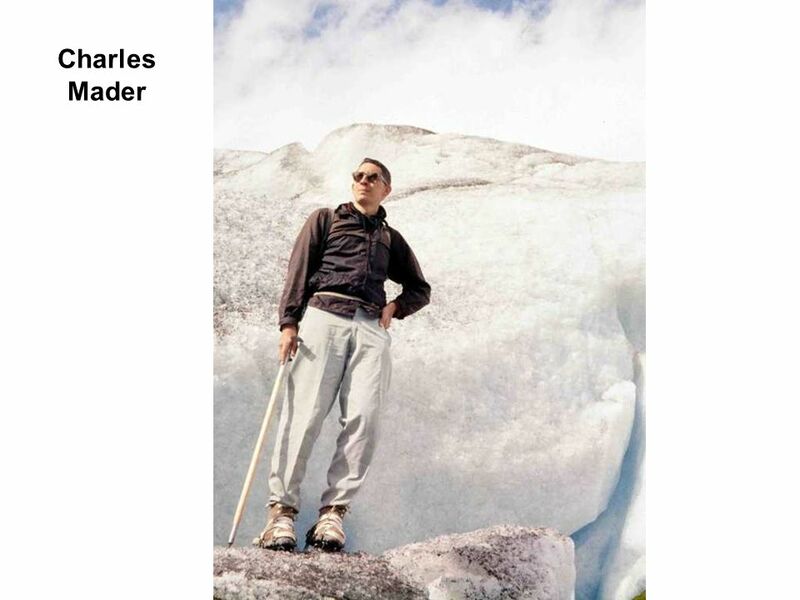 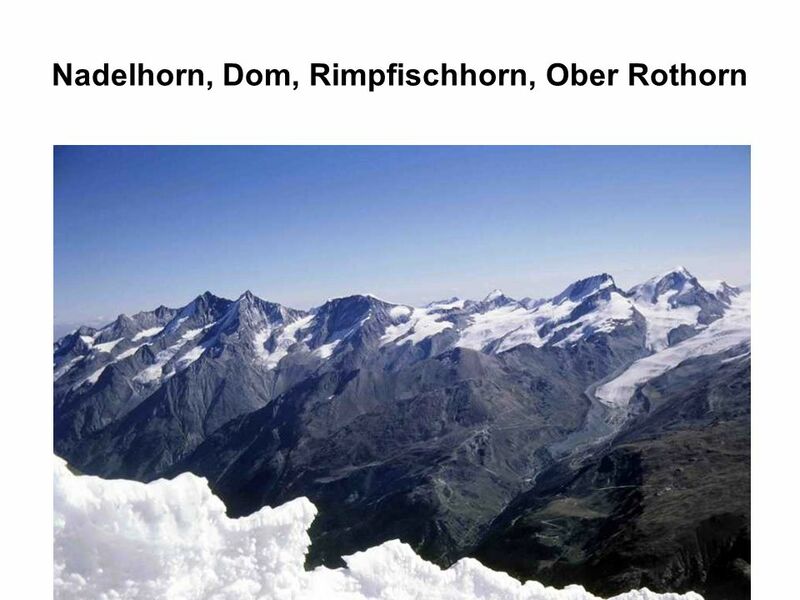 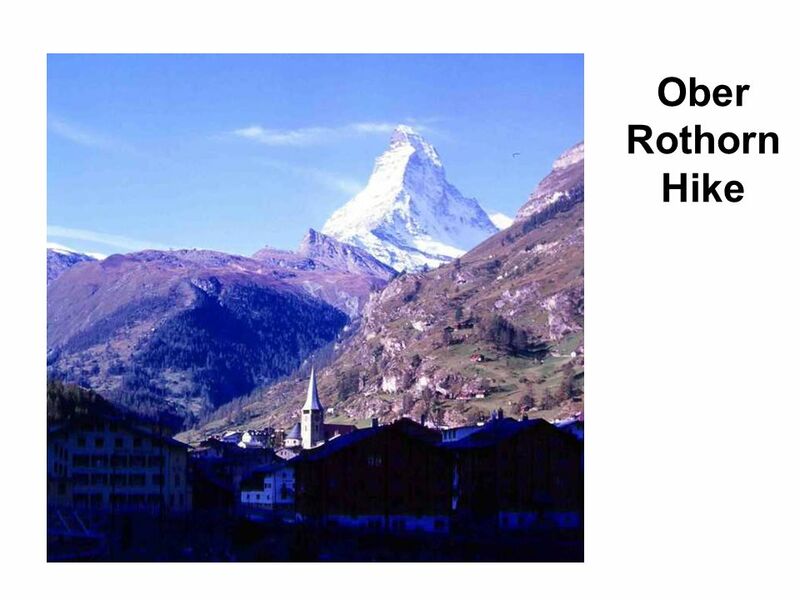 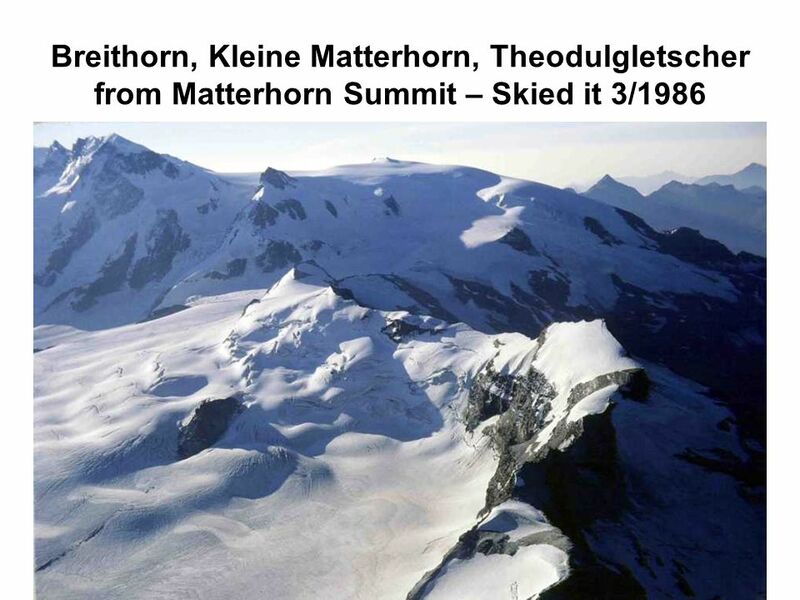 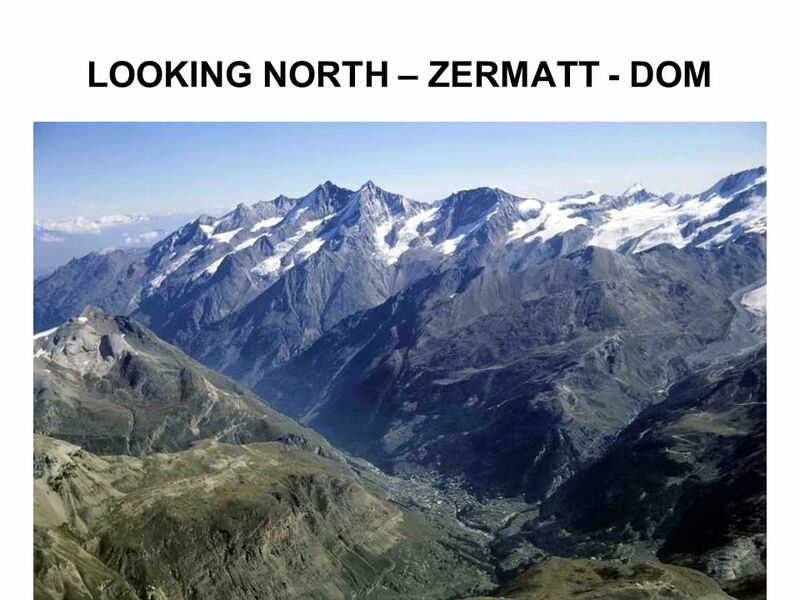 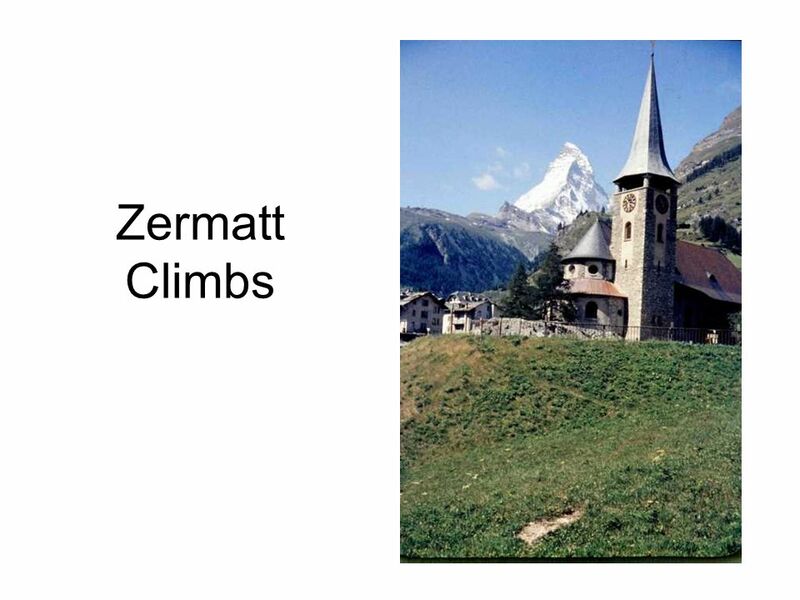 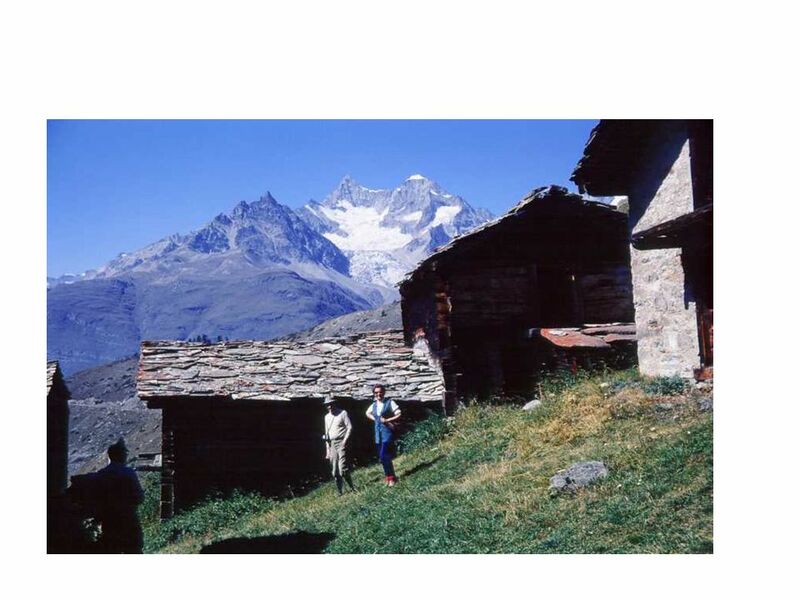 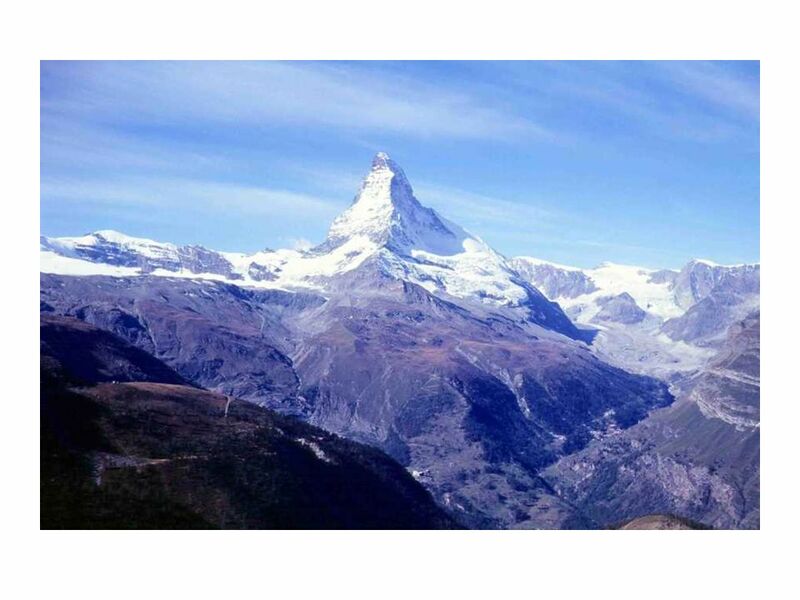 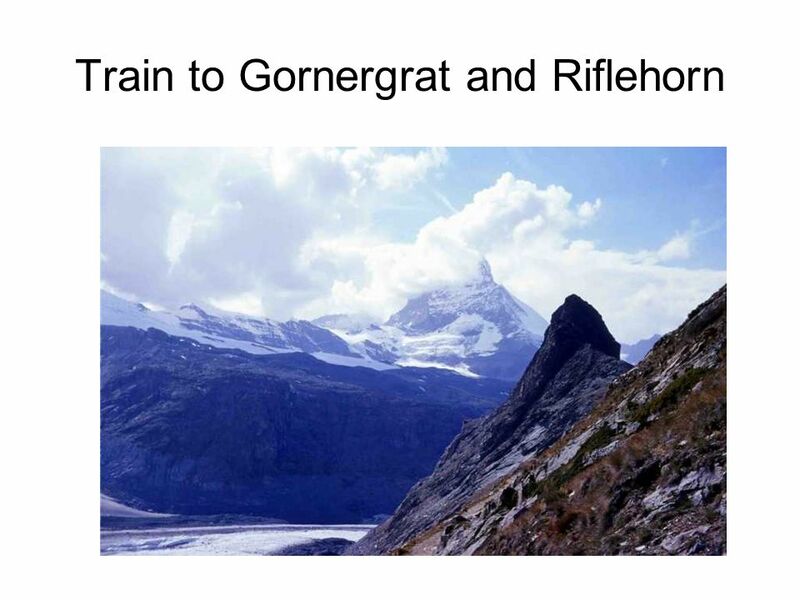 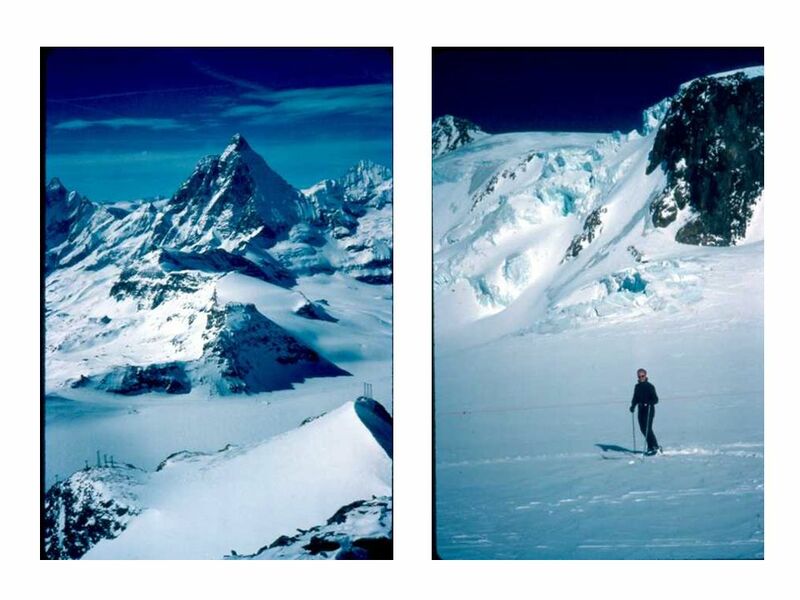 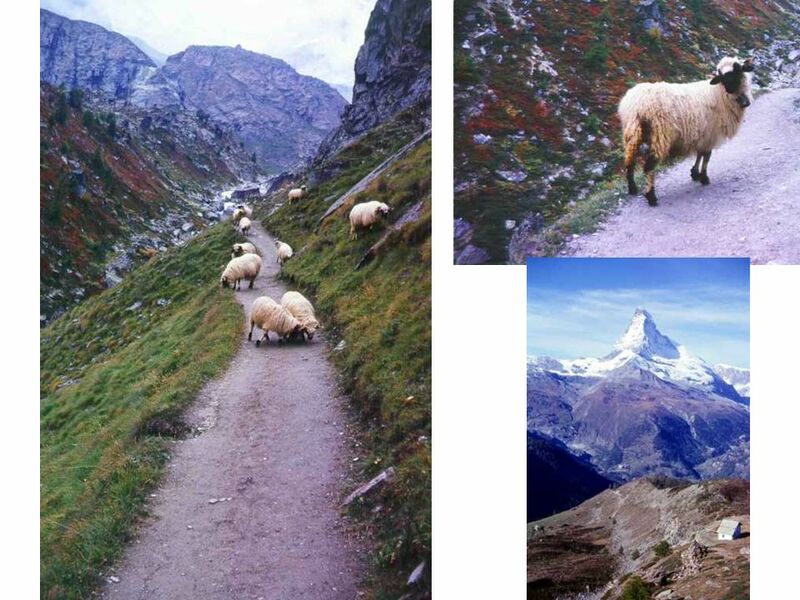 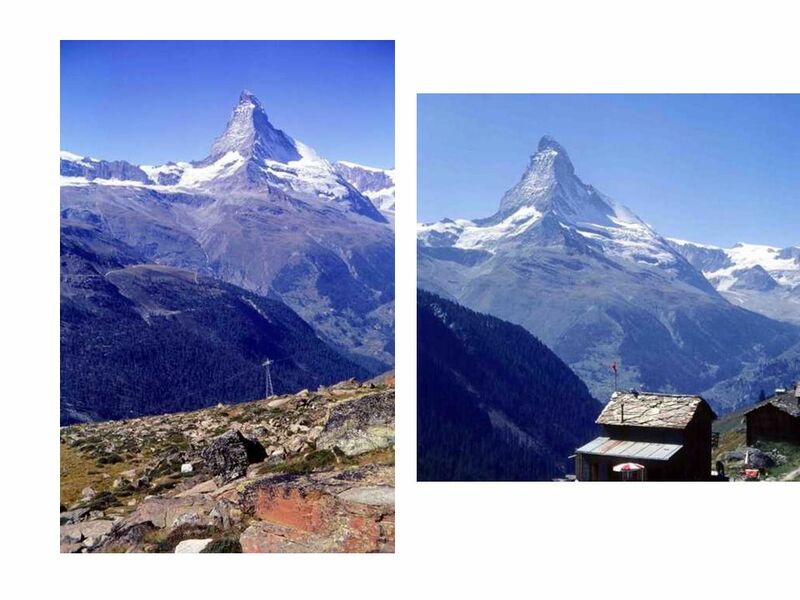 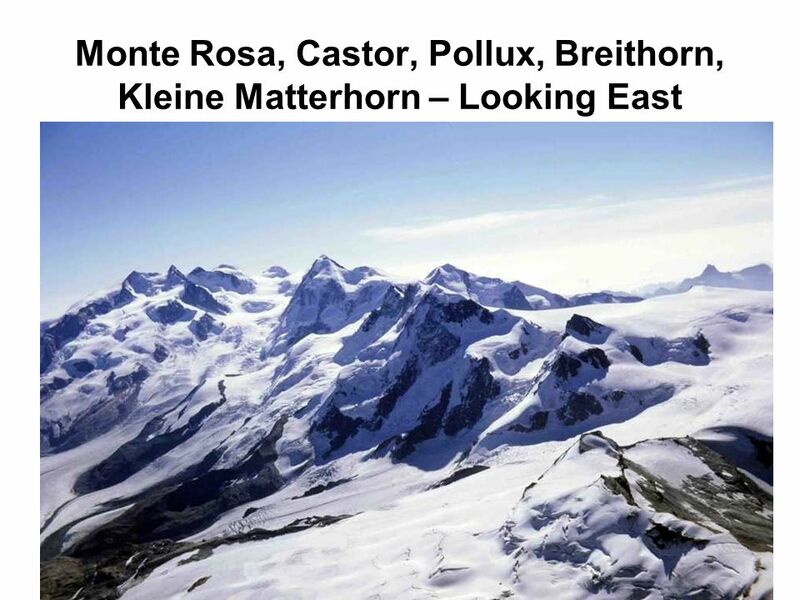 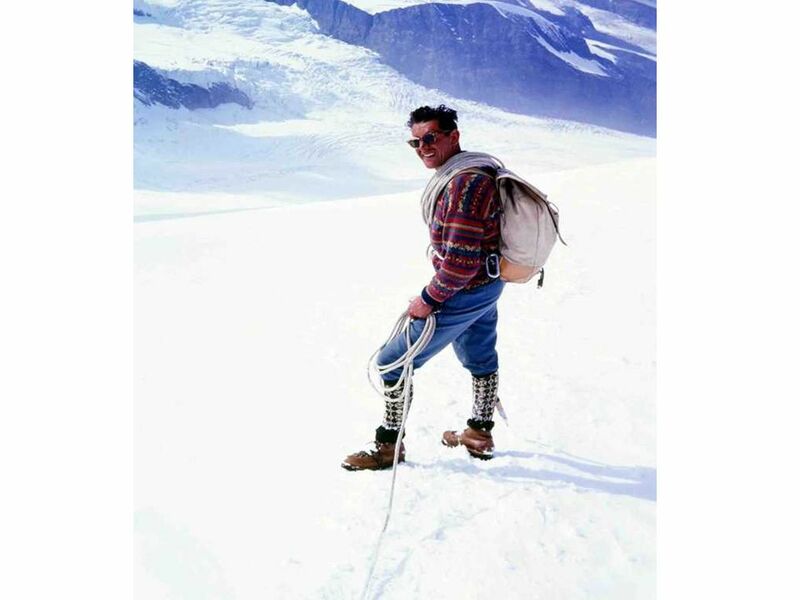 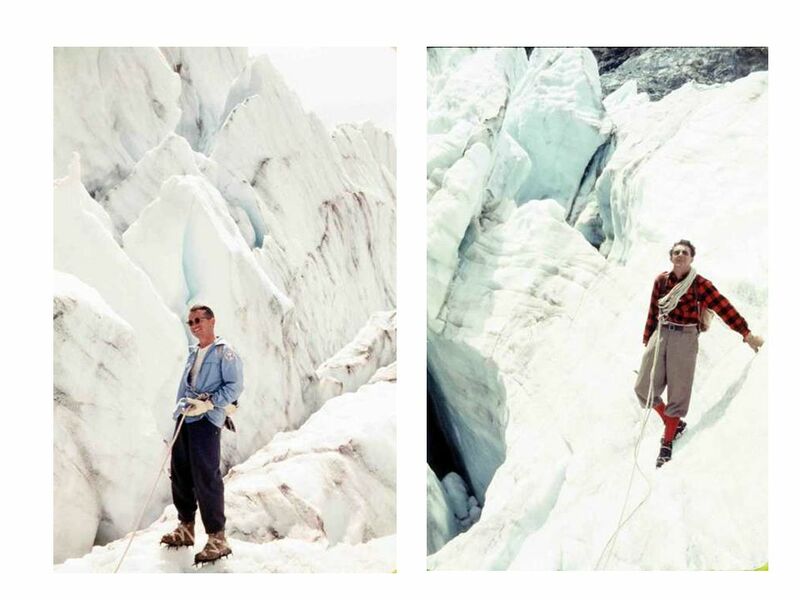 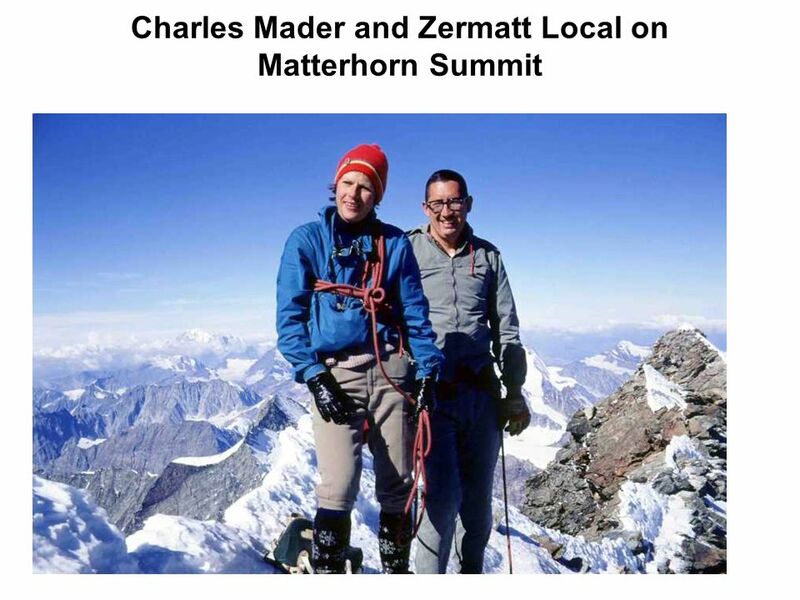 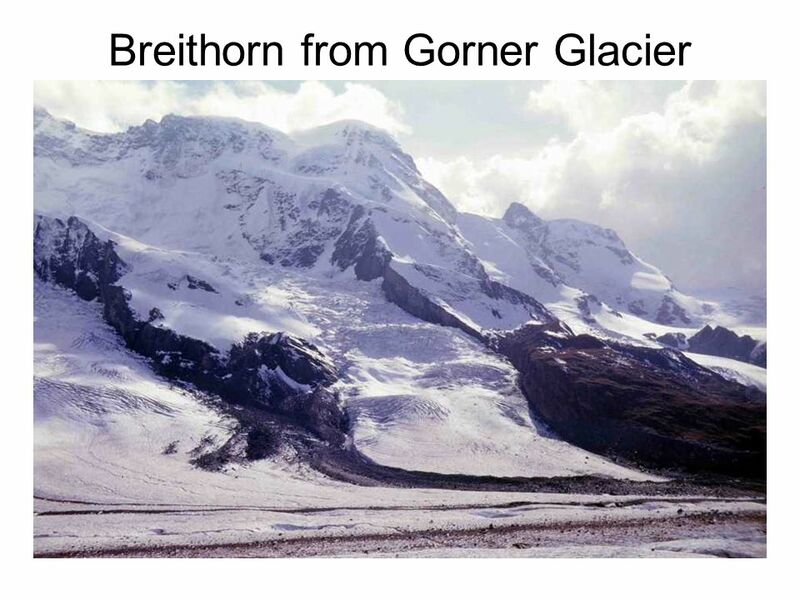 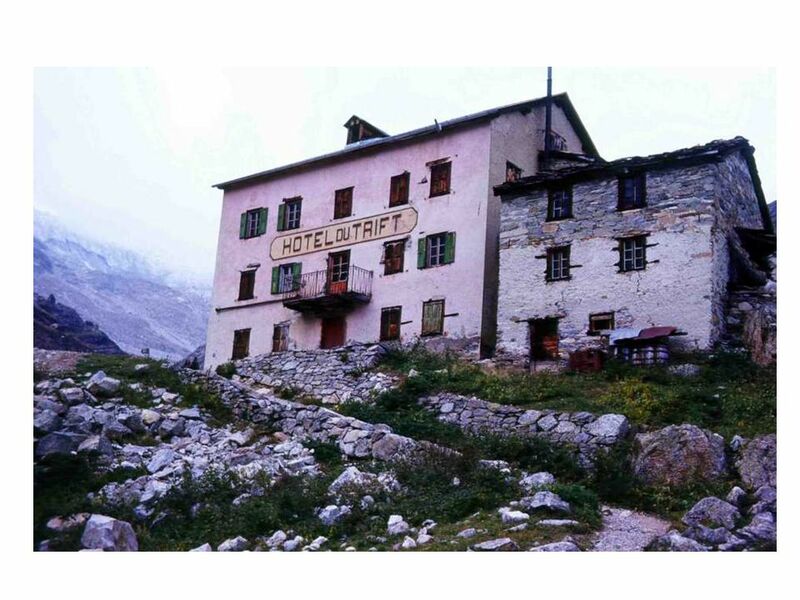 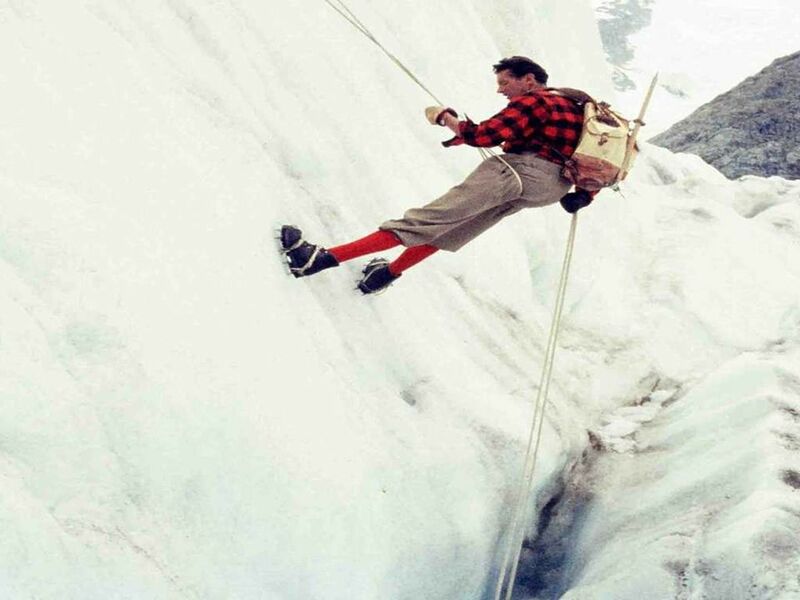 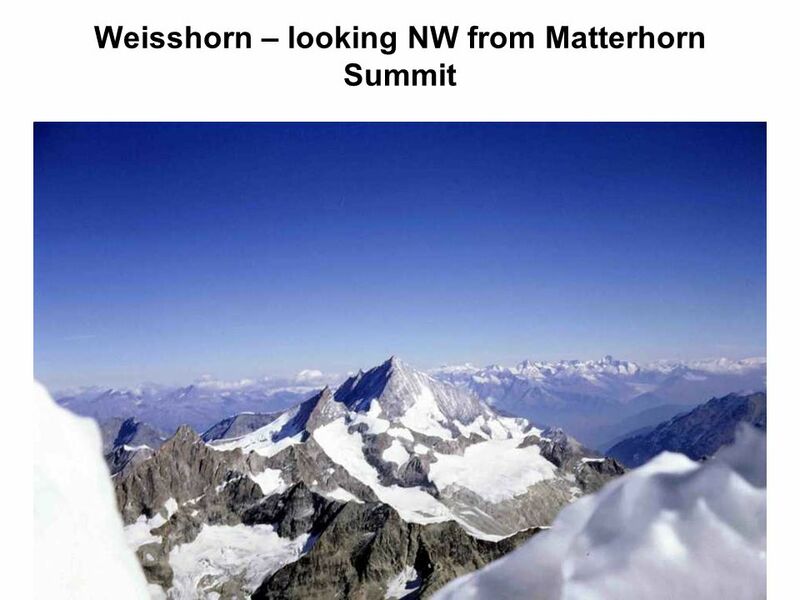 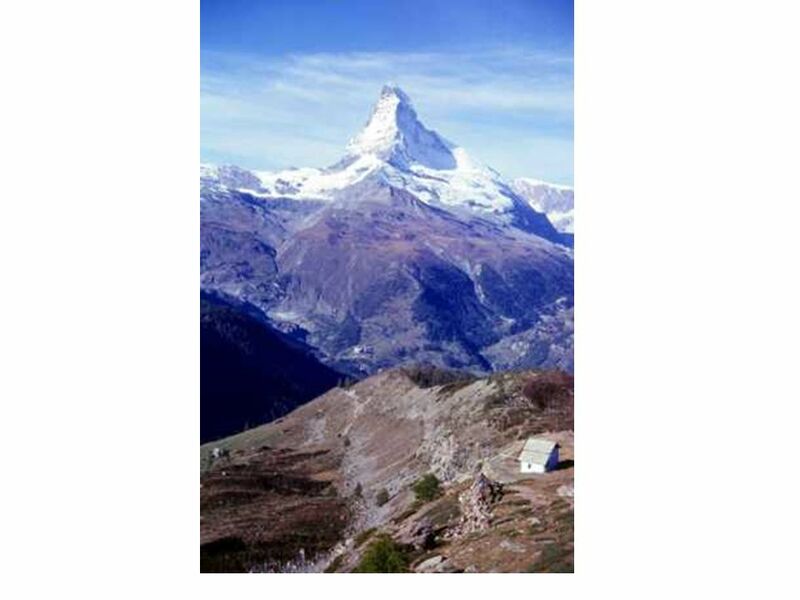 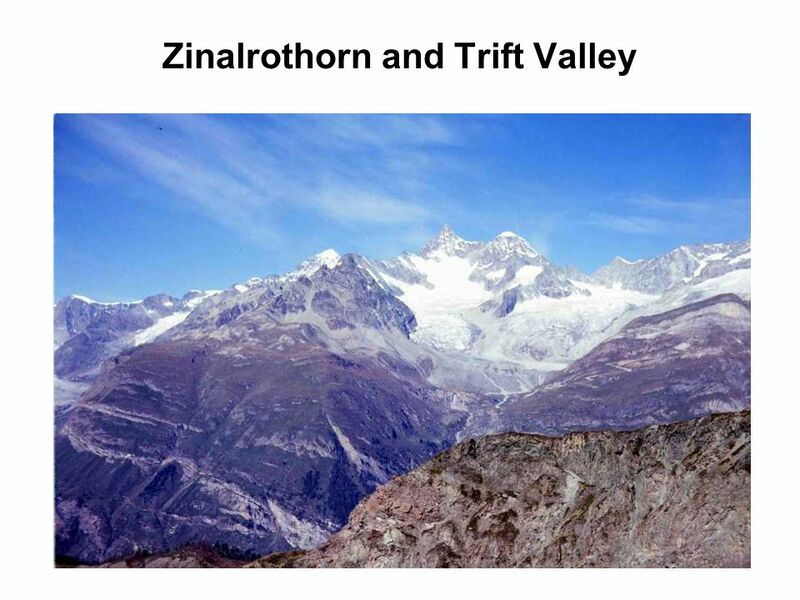 Third Trip to Zermatt to climb Matterhorn and this time during climbing season – it was last climbing day of 1971 as snow storm arrived after we returned to hut. 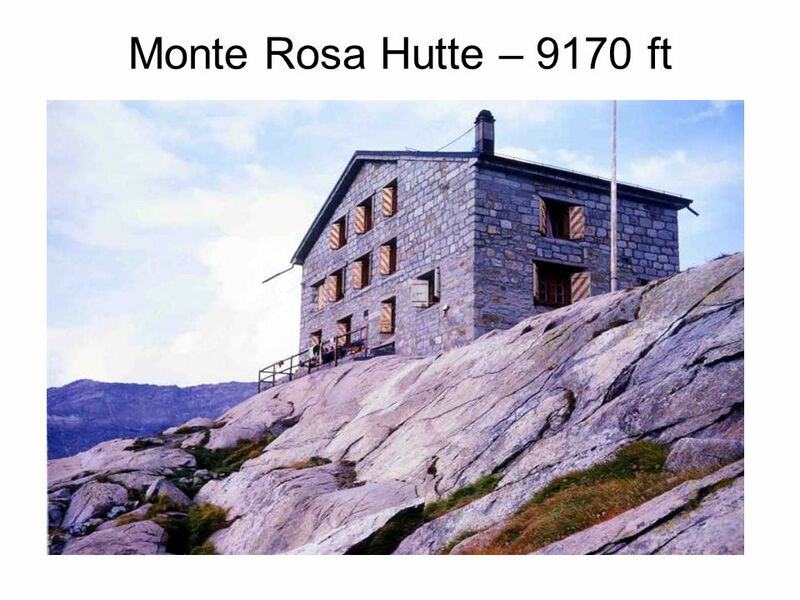 From hut climb took 5 hours up, 4 hours return. 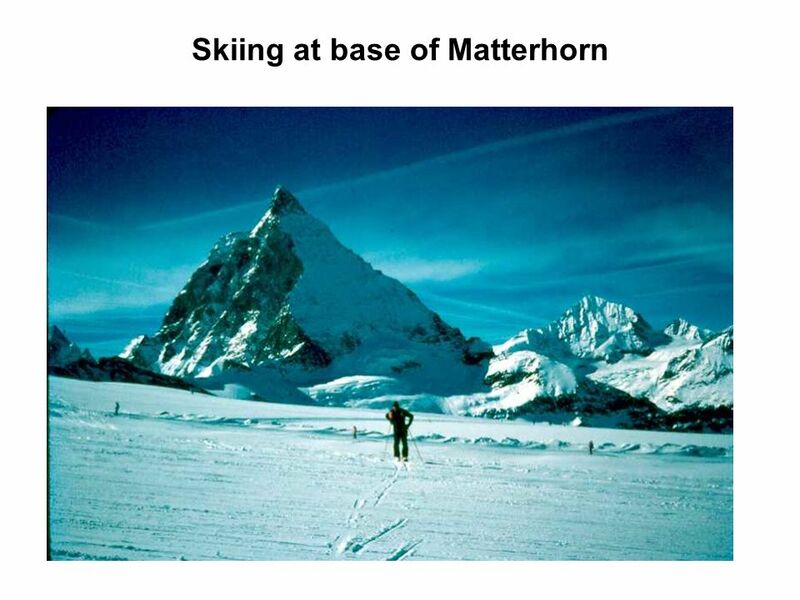 Skiing Adventures. 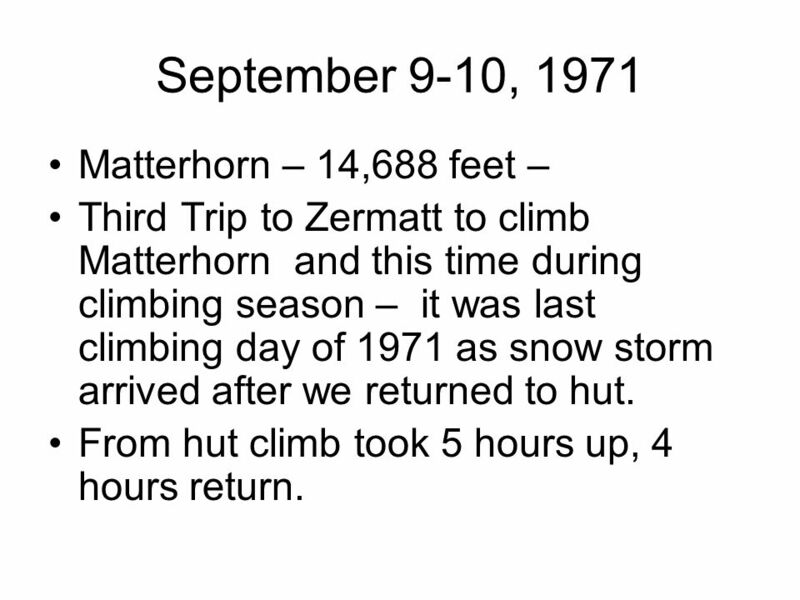 TAOS Ski Valley Cabin – 1962 to 1985 Wheeler. 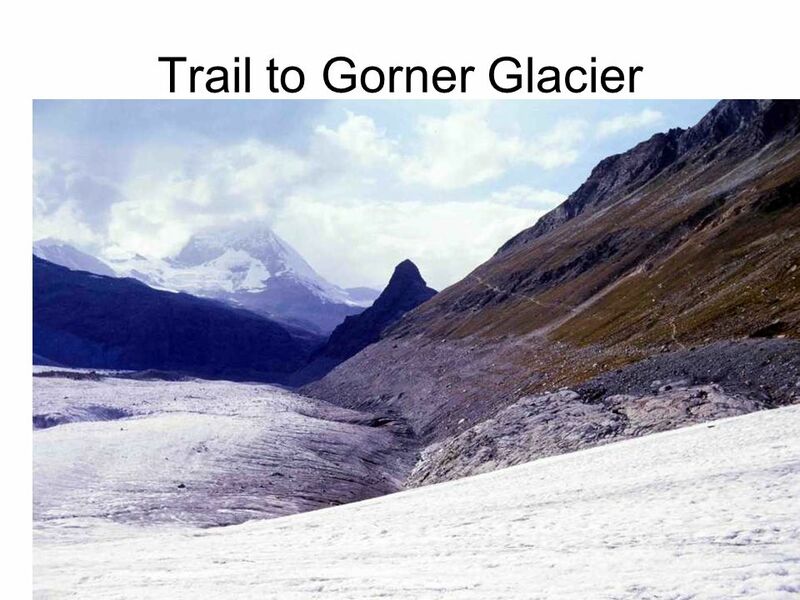 Appalachian Trail Backpacking Great Smoky National Park December 28 th – January 4 th 2014. 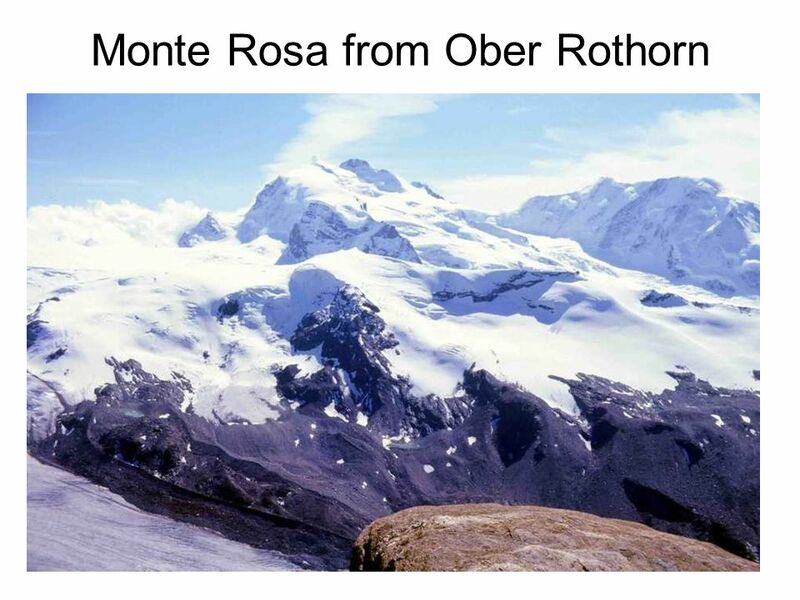 Ascent of Mount Rainier (14,410) May 24-26, 2005 My buddy Jon Pineau and I decided to attempt Mt. 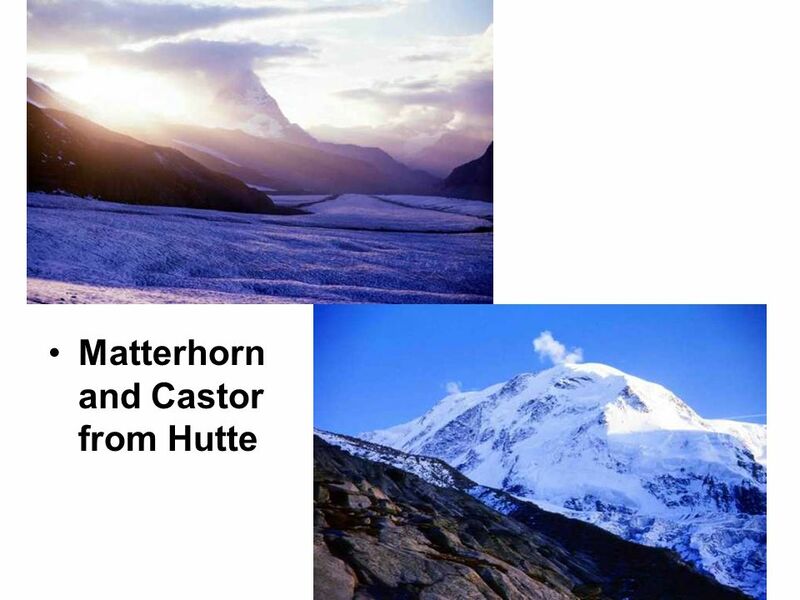 Rainier since we were in Washington for a 7-leg Adventure. 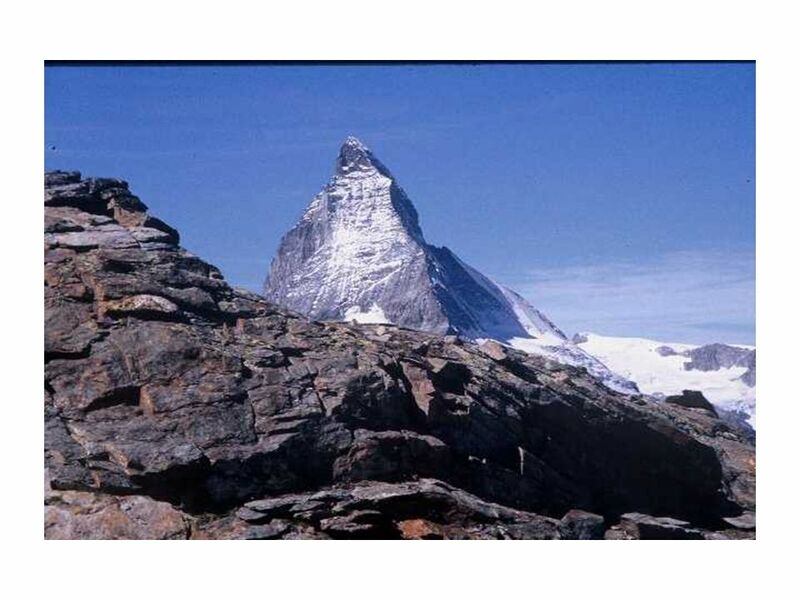 牛津高一上学期英语模块二 Unit 2 grammar and usage 南航附中 高一年级组 徐贤芝. 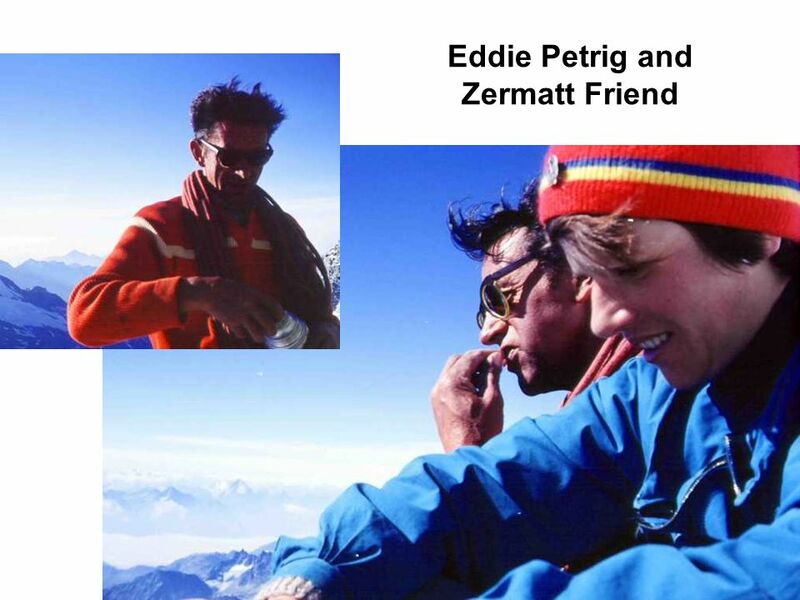 Peru, 2013 Artesonraju, 6025 m (19,800’). 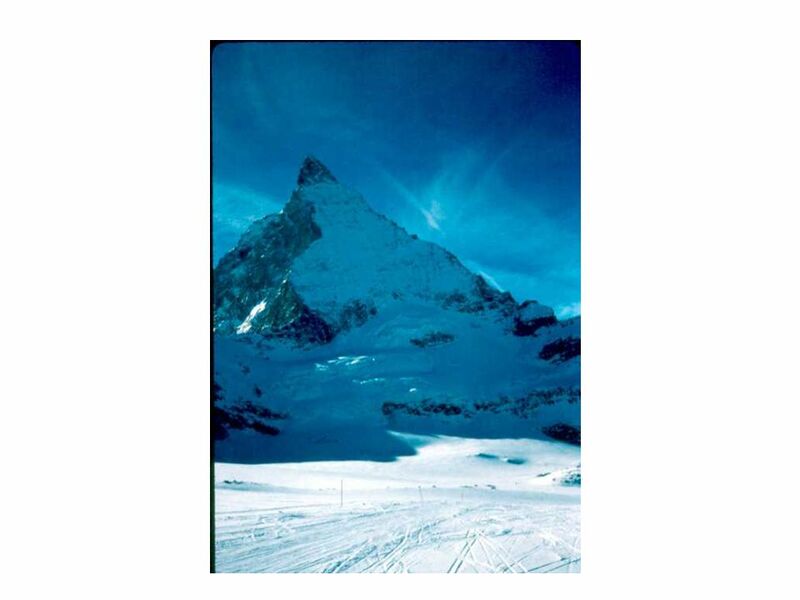 Our goal is the famous peak from the Paramount Pictures logo.